Freerangers - www.freerangers.co.uk - United Kingdom - Email: info@freerangers.co.uk - Ph. 01207 565957 - Manufacturer, online sales, and mail order company of 100% vegan products. 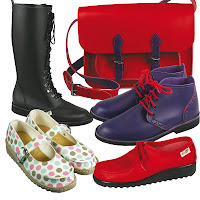 They offer shoes, boots, bags, belts wallets accessories. They sell vegan products that they make themselves, in the U.K. They set out in 1997 to find suitable material to make vegan shoes - and in 1999 they started Freerangers. They are certified vegan by The Vegan Society U.K. They're bringing to market comfortable casual shoes in a wide variety of colors; a range that is unique in the UK, and probably the world. Vegan Online - www.veganonline.com.au - Contact Kym - Ph. 0438196 336 – Kym explains “Our shop is in Woodside, S. Adelaide – Australia, and we are always open to have a coffee and a chat with anyone wishing to broaden their knowledge about vegetarian/vegan diets and lifestyle. Vegan Online is an online store only, but who knows what the future may hold; as the increase of awareness may lead us to opening a shop front in Adelaide. We also have a sanctuary for rescue farm animals so between the online store and Freedom Hill Sanctuary we are kept pretty busy.” Kym goes on “Vegan Online started because we found going from one shop to another just trying to source good quality affordable vegan products was tiresome and like me, working full time, it was difficult. 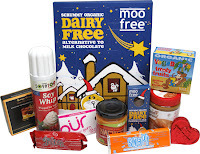 Our enormous range of goodies includes mock meat and mock dairy products along with cosmetics, toiletries, pet care, general grocery items and household items which are 100% vegan and CCF approved where applicable.” There are only 2 people working at Vegan Online; Kym and her daughter Kelly; both are vegan. Kym and Kelly wanted to offer one stop online shopping to customers looking for high quality affordable vegan products sent to everyone in Australia. 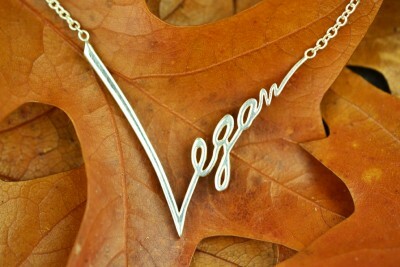 Vegan Online has just turned two and with each birthday, they give away presents in appreciation of their customers. Ethikool - www.ethikool.com.au - Ph. 0418730301 - Email: info@ethikool.com.au – SA, Australia – An online store, as well as selling at markets and events. All products are vegan, no animal testing, no harsh chemicals, no palm oil, no sustained palm oil, and only Australian products; home cleaning, toiletries, cosmetics, skin care, food such as chocolate, jams, chutney, dukkah. Owners; Kerri Jones and Glen Alderson only deal with companies where their whole entire range fits their strict criteria, not just a few of their product lines. Kerri and Glen could not find a one stop shop that covered their needs (vegan, palm-oil free, natural), so they started Ethikool in January of 2012. Glenn travels to Borneo once a year to work with the Orangutan organizations there and to photograph the rescued/saved Orangutans; which is all a part of their being vegan and palm-oil-free. Michelle Leon's High-End Accessories - http://www.michelleleonvegan.com/ - Sold through internet and at vegan festivals and conferences - Brooklyn, N.Y. - The owner, Michelle Leon, says "Motti and I have been involved in the fashion world as designers and developers for many years. And we feel that it is our responsibility to declare with our creations that we do not tolerate the use of animals as products. It is vital to set this example for the fashion world. We create high fashion jewelry, belts, and handbags in our studio in Mid Manhattan, proving that it is possible to create elegant fashion that is purely vegan. We believe in the welfare of all living beings. We use materials that are 100% vegan, aesthetically pleasing, friendly to the environment, and produced in countries that respect the welfare of their workers and enforce labor laws." She continues "The material we use is soft and highly durable recycled polyester. We design and create, in our studio in Brooklyn, the hardware for our bags and the buckles for our belts from silver sterling, bronze and semi precious stones. Our launching line is a collection of animals with which we celebrate the beauty and life of animals." Strange Vixens Inc. - www.strangevixens.com - Email: info@strangevixens.com or visit on Facebook or twitter. Location: Brooklyn, N.Y. They're an online vegan-friendly clothing company; an alternative women's wear brand; offering garments/products that are animal skin and fiber free; No animals get hurt in the process of producing their garments. No (silk, leather, nylon, bug extras for dying) are used. 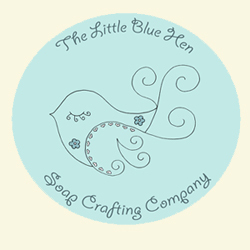 They also try to sell eco-friendly products such as using organic cotton blends and hemp blends. 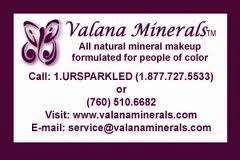 Vianca Frazier is the owner of this company; which is not vegan-owned and operated. The inspiration for this company began with a love for burlesque dancing and alternative rock culture. Truth www.truthbelts.com www.vegetarianbelts.com Toronto Ontario, Canada - Renia Pruchnicki; owner designs and manufactures belts, cuffs, suspenders, dog collars and leashes, and SITband – and all products sold happen to be vegan. Truth has been in business since 2001. In 2003 P.E.T.A voted Truth "Best Leather Replacement Clothing Company in North America". Ecolissa - www.ecolissa.com – Email: CustomerService@Ecolissa.com – USA – Online store carrying only fashionable eco-friendly and 100% vegan women’s clothing and accessories. Owner; Melissa Dion intentionally chooses only vegan products for her vegan-owned and operated store. Melissa explains “I had become a vegetarian Jan 2008 and have since become vegan. I wanted my wardrobe to reflect my diet (and morals) so I got rid of all my leather, wool, silk, etc. But I noticed that a lot of my new vegan options were not environmentally-friendly. They were usually polyester or vinyl. That did not make sense to me; I didn't want to save animals at the expense of the planet. So I did some research and found products that are both eco-friendly and vegan!” Ecolissa has been in business fsince 2010 offering clothing and accessories made of sustainable fabrics such as organic cotton, soy, bamboo, hemp, modal, tencel, and recycled materials. Many are also fair trade and made with low impact dyes. These fabrics are made from plants that require less water and grow quickly. These fabrics are high quality and very soft! Gunas - www.gunasthebrand.com - Located in Long Island, New York, USA – Gunas is a vegan handbag brand with an online store as well as selling product via specialty boutiques around the world. The bags and handbags are for men and women. They are not only a 100% vegan, but also a sweatshop-free designer range of bags. Owner; Sugandh G. Agrawal tells us “We are PETA approved and listed on their site directory of vegan businesses. All our hang tags and tags inside the bag mention that they are vegan. The inspiration behind starting the company was our love for animals and a passion for design.” Gunas has been in business since 2009 and they specialize in custom bags. Okabashi - www.okabashi.com - 100% Made in Buford, GA., USA - Ph. 800.443.6573 - Okabashi is an American manufacturer of vegan-friendly footwear that are sold at mass-retailers around the country & sold online. 100% recyclable, comfort footwear- available in flip-flops, slides and closed toe styles. All Okabashi shoes are 100% recyclable & Vegan-friendly; as stated on their website. Their inspiration was to create the most comfortable shoe ever. Okabashi shoes have been in existence since 1984. With the growing popularity of vegan living, they just recently thought to market the shoes to the vegan community - because they happen to be vegan. Olsenhaus – www.olsenhaus.com - Pure Vegan and founded in New York City in August 2008. Olsenhaus shoes are sold online through their website, as well as select retailers around the world. Contact details: For general info: info@olsenhaus.com - For press/media: press@olsenhaus.com - For customer service: orders@olsenhaus.com – Connect with them on Facebook: Olsenhaus – Pure Vegan, on Twitter: @Elizabeth_Olsen – The line is sold in 14 countries at select retailers; both department stores and boutiques. Notable stores include Nordstrom, Amazon and Brandos. Olsenhaus is contacted on a daily basis by eco-boutiques that are opening all over the world. Founder; Elizabeth Olsen tells us “We are a brand of consciousness. 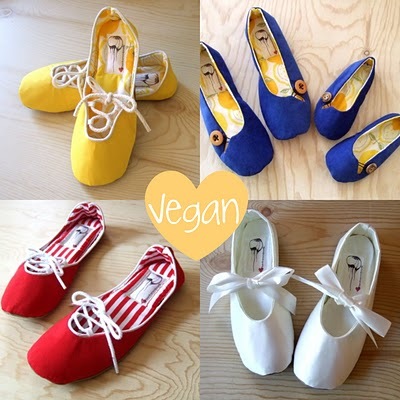 Our shoes are 100% cruelty-free, using only non-animal materials that are environmentally friendly. We use alternative, sustainable and renewable plant-based and man-made, non-animal materials such as: ultra suede, organic cotton, canvas, nylon, velvet, linen, cork and a synthetic eco-lining. We are 100% vegan, no leather, fur, wool or silk is ever used. Soles are a composite of rubber, glues are rubber-based and vegan and non-toxic. It is 100% intentional for our products to be vegan.” It is even stated in the logo. Olsenhaus is vegan-owned and operated. Elizabeth Olsen created Olsenhaus to merge her love of art, design, fashion, function and being a voice for animals. NOAH – Italian Vegan Shoes - www.noah-shop.com - Email: info@noah-shop.com – Location: Germany. 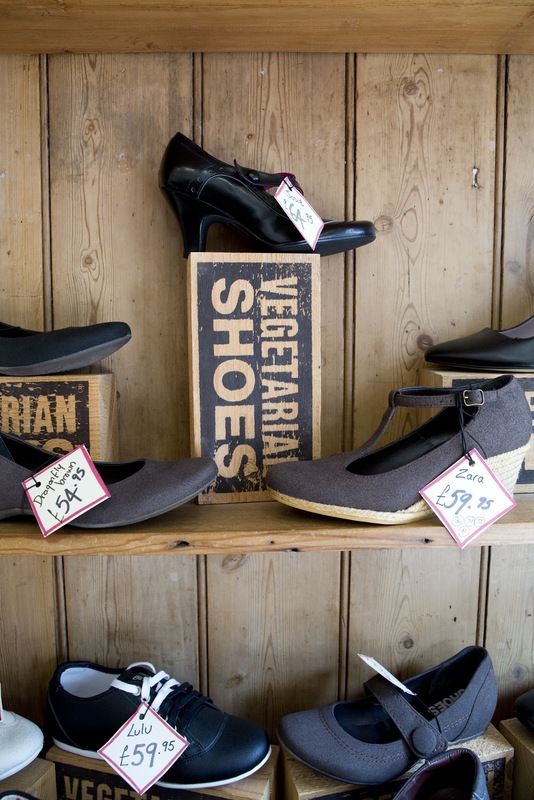 They produce vegan shoes in Italy and sell them in their shop in Marktheidenfeld-Germany, online worldwide, and through some retailers in Germany and Italy. They offer vegan shoes, but also bags, belt and some scarves. They sell only vegan products, and that is intentional. They explain, “We want to fulfill our contribution so that there will be a change in this world. Our vision is a world in which human beings, nature and animals may live in mutual respect and peace with one another, and share happiness with the other. The beauty, the harmony of colour and form, and the wellbeing of humans are of equal importance to us. It is well-known that in Italy the art of shoemaking has already reached its peak, and is, therefore, valued worldwide And that is the reason why we have chosen Italian firms to make the beautiful and, at the same time, comfortable shoes for us, out of high quality and leather-free materials.” NOAH shoes are certified by “Vegan Society” in the UK. In business since April 2009, Massimiliana Delù; the owner, set out to create casual but also elegant and business shoes with Italian design and manufacture. Veganline Shoe Shop – www.veganline.com - London, England - Ph. 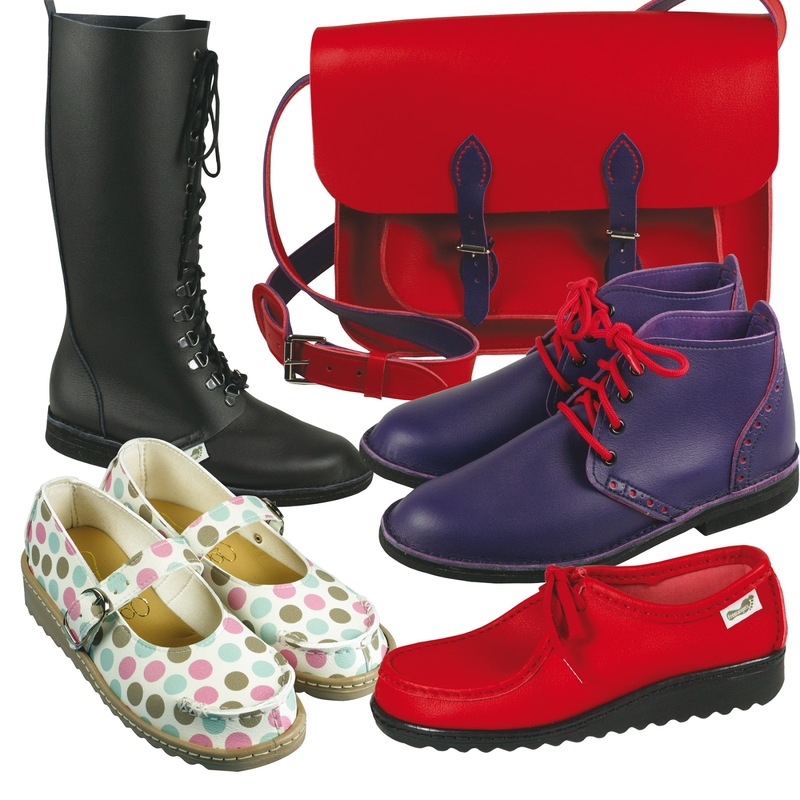 +208 286 9947 – They offer boots, shoes, belts, and wallets made in democratic welfare states out of vegan materials. “We introduced the bounciest vegan boots to the market in 1998 and have, obviously, basked in the glory ever since” says owner John Robertson. 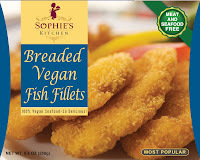 They are certified by the U.K. vegan society. Veganline is operated by mostly vegan staff. VeganWares - www.veganwares.com - Collingwood, Australia. Both a shoe retail shop and online store. 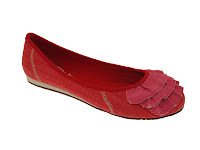 They offer high quality non-leather shoes and accessories. All products are intentionally vegan and cruelty-free – and they certify that themselves. The company is owned and operated by vegan staff. In business since 1995! 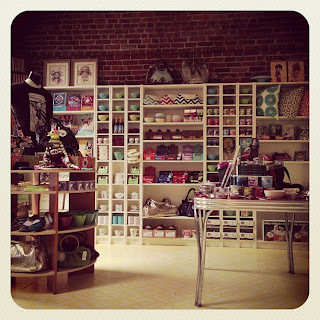 www.AlternativeOutfitters.com - Online shopping and a retail vegan boutique in Pasadena, CA., USA - Ph. (626) 396- 4972 - Contact: Jackie Horrick. 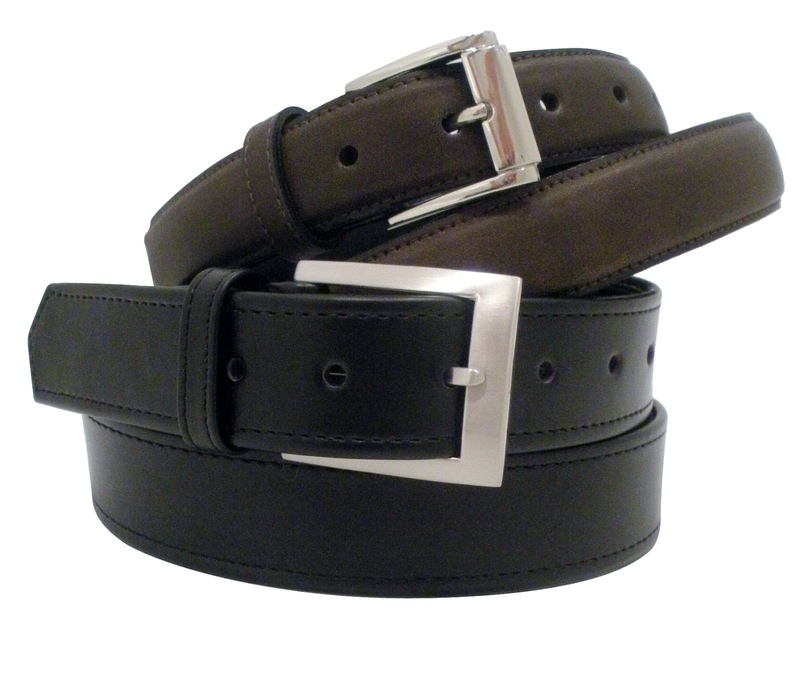 They sell leather alternatives and cruelty-free products for both men and women; with a focus on fashion. They sell shoes, bags, wallets, belts, faux leather jackets, wool-free coats, message tees, jewelry and personal care products. 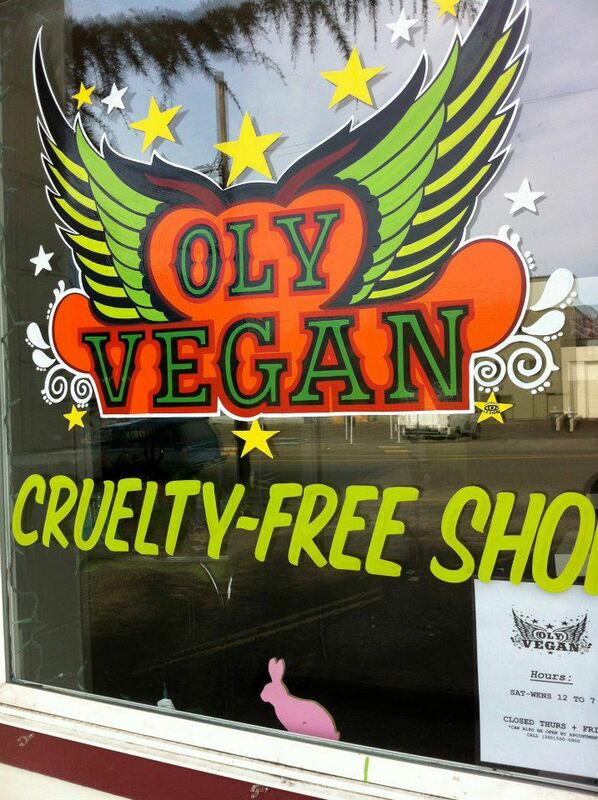 An intentionally vegan shop, they only purchase cruelty-free products to sell in the store. Owners; Jackie Horrick and Henny Hendra wanted to make it convenient for people to shop with compassion without sacrificing their fashion sense. At Alternative Outfitters you don’t have to sacrifice fashion for a more compassionate lifestyle. You can have both! 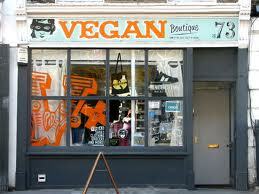 Alternative Outfitters is operated by vegan staff, however, they did not require their staff to be vegan. Jackie tells us “We just hope that by being a part of our team, they will learn more about animal rights and the vegan lifestyle and they may eventually choose to go vegan on their own due to the exposure.” Alternative Outfitters has been in business since April 2004 (8.5 years). They have a friendly, sweet pit bull rescue, Jack, who is the official greeter when people come into the shop. Vshoen Boutique - www.vshoen.com - Email: info@vshoen.com – Location: Victoria B.C., Canada – Ph. 250-590-SHOE (7463) Facebook - Twitter - Intentionally 100% vegan retail store offering primarily footwear for men and women, but also purses, belts, wallets, jewelry and accessories. Owners: Regan Forrester and Devyn Sieben set out to fill a niche not already in their city of Victoria, BC Canada, so they opened their doors on August 20, 2011. They tell us “Our company name is a fusion word made from vegan+shoes+fashion but the pronunciation (v-shun) actually means "it’s good" or "it’s beautiful" in German! Mordam Art - www.mordamart.com – Location: Livingston, MT., USA –Ph. 406-222-0321 - Mordam Art is a studio/ fine art gallery offering hand-made glass bead jewelry, vegan-themed jewelry, and original paintings. Owners; Bonnie and Parke Goodman, are vegan, and they intentionally turned the gallery vegan; they stopped using pearls (Bonnie’s best seller at the time), feathers, coral, beeswax, and bone beads when they went vegan in 2007. 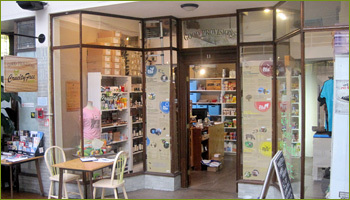 The Cruelty Free Shop - www.crueltyfreeshop.com.au – Email: info@crueltyfreeshop.com.au - Glebe NSW, Australia – Ph. 02 9660 9426 – Online and retail both; vegan grocery store offering a wide range of vegan food plus certified cruelty-free products (household cleaning, cosmetics, hair care, etc.) They are presently in the middle of a palm oil audit and getting rid of any products that don’t meet criteria. They only stock products that have cruelty-free accreditation from Choose Cruelty Free Australia or Leaping Bunny. Owner; Jess Bailey, explains that her inspiration for starting The Cruelty-Free Shop was “to make it easier for people to become and stay vegan.” This vegan-owned and operated business began in 2001. Jessica also founded Sydney's first vegan festival: The Cruelty Free Festival - which is held the last Sunday of October every year: www.crueltyfreefestival.org.au – Find them on Facebook and Twitter. The Cruelty Free Shop - www.thecrueltyfreeshop.co.nz – is a store in Auckland, New Zealand and an online 100% entirely Vegan store; no meat, fish, dairy, eggs, honey, gelatin, lanolin, wool, fur, silk, suede and leather. NO Animal Testing. 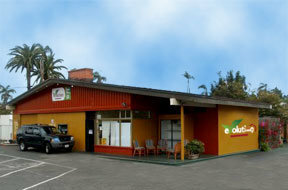 They sell vegan food and beverages, groceries, ready-to-eat and meal ingredients. They also offer footwear, bags, belts and other personal accessories, health and beauty products. They say “We avoid stocking any items containing palm products unless certified sustainable and not from areas which would impact animal life. This company is owned and operated by vegans; the Peterson-Creek Family. Jill Peterson tells us “Our company is owned and operated by vegans. This business used to be owned by S.A.F.E (Save Animals from Exploitation). The Peterson-Creek family took over the operation this year (2012). Vx - www.vegancross.com - Vx is a shop in London, UK and they have a webstore and ship worldwide. They sell food, clothes, shoes, accessories, books...specializing in cool stuff. They offer vegan junk food like biscuits, cakes, cupcakes, and hard to find items. They also sell their range of merchandise and t-shirts under the name Secret Society Of Vegans. 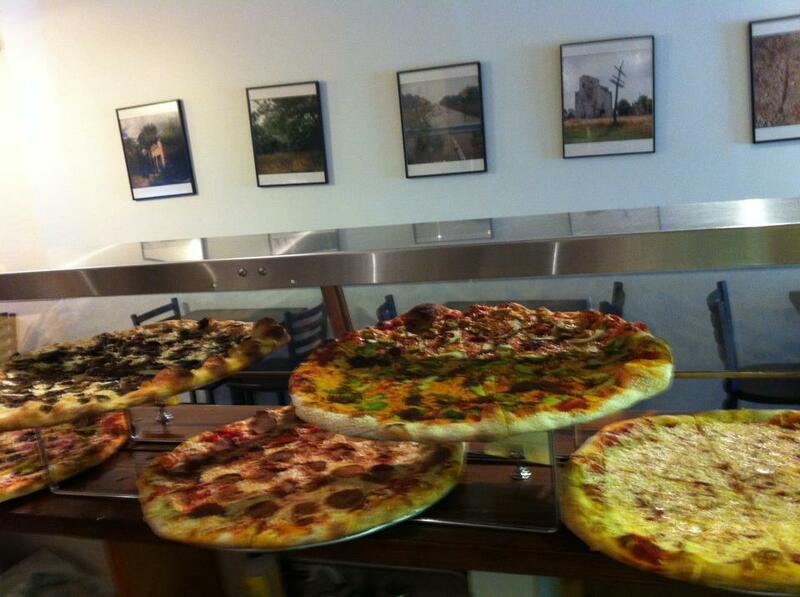 The owner; Rudy Penando, tells us “We are a vegan company; owned and operated by vegans. Rudy responds to the inspiration behind the business “It was an accident. It all started with printing t-shirts ("Secret Society Of Vegans") to raise money to open a vegan café (Pogo Café, East London) in 2003-2004, then became a mail-order, then we had a stall at the Camden Market (2009), then opened the shop under the name Vx in February 2010. One thing led to another. There was no plan.” Rudy adds “We try to break stereotypes about vegans. We are not hippies. We are not obsessed with healthy diets. It’s run by volunteers.” Rudy answered “Yes, we are selling some products that contain palm oil because it's everywhere! It's really hard to find biscuits that don't contain palm oil. We are not manufacturing these products but I would like to see some legislation banning palm tree oil.” They’re certified by The Vegan Society certification label. Sarah's Place - www.GoVegan.net - Email: sarah@govegan.net - Location: downtown Victoria B.C., Canada - This 100% vegan boutique was established online in 2009, and then opened a bricks and mortar store in July 2011. Online sales at webstore. Sarah's Place offers unique and interesting vegan products; everything from cookbooks, chocolates, vegan marshmallows, teas, pottery, hand-made goods, perfume, soap, skincare, hair products, clothing, cute dresses. 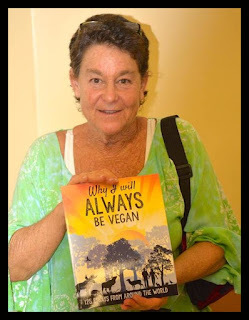 Owner; Sarah Kramer, is the internationally best selling author of 4 vegan cookbooks: How it all Vegan, Garden of Vegan, La Dolce Vegan and Vegan a GoGo. 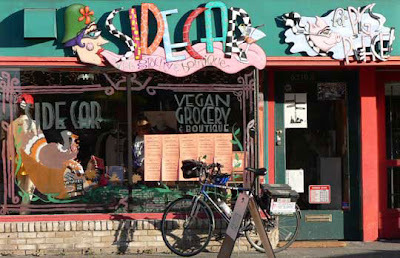 Vegan Haven - www.pigspeace.org - Seattle WA. - Ph. 206-523-9060. 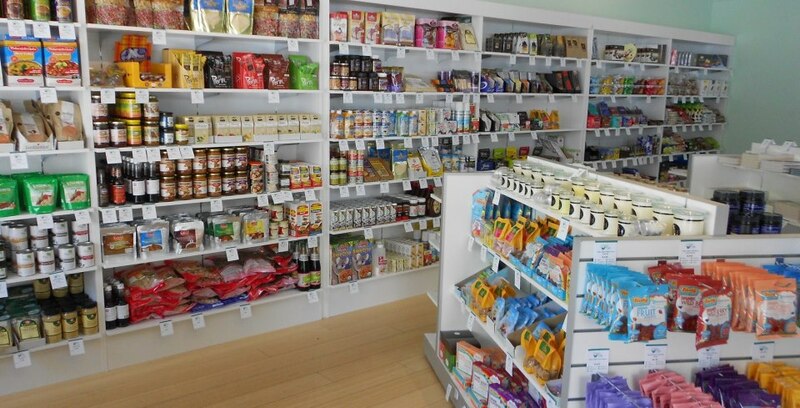 This grocery and boutique are proud to say that they only sell vegan products, which include: Groceries (shelf-stable, frozen, chilled), books, purses and wallets and belts, body-care, t shirts, companion-animal food and treats, etc. Many of their products, like any grocery store, contain palm oil. They carry alternatives whenever they are available, and ask suppliers to move away from palm oil. None of their products contain white refined sugar. They “do not carry any products that are tested on animals, including parent companies when we know that level of information.” Pigs Peace Sanctuary; a non-profit, owns the store and it is owned and operated by vegan volunteer staff. Only the manager is a paid employee. They’ve been in business since 2005. City Green Market is a 100% vegan natural foods store in the beautiful Upper Peninsula of Michigan which opened in April of 2014. City Green Market offers a small but very thoughtful collection of both vegan food products, body care, and other natural products with a strong emphasis on organic and fair trade items. Owners Jeff and Carrie Plummer are convinced that creating and supporting vegan businesses is a critical economic component to spreading the vegan idea. City Green Market has future plans to grow and add an organic, fair trade coffee bar and a vegan deli. 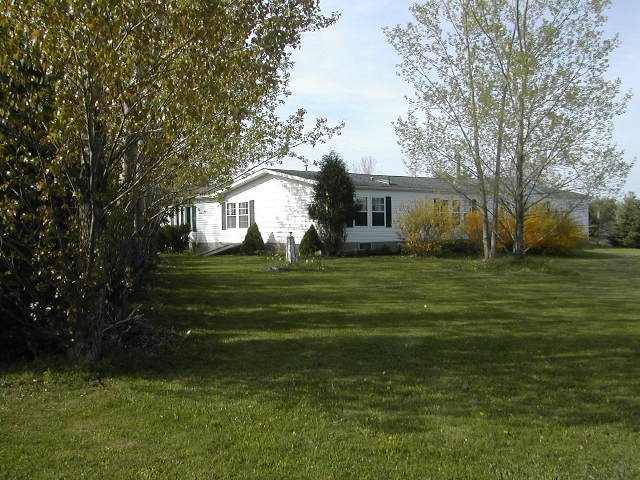 Located at 202 Iron St., Negaunee, Michigan which is 12 miles from Marquette and Lake Superior. Phone: 906-475-6000. Come visit us at our store or on Facebook. Se Habla Vegan! 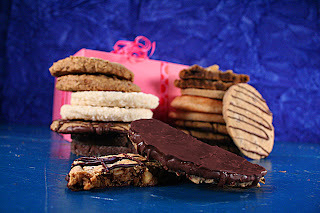 Allison’s Gourmet – www.allisonsgourmet.com – Email: getintouch@allisonsgourmet.com – CA., USA. 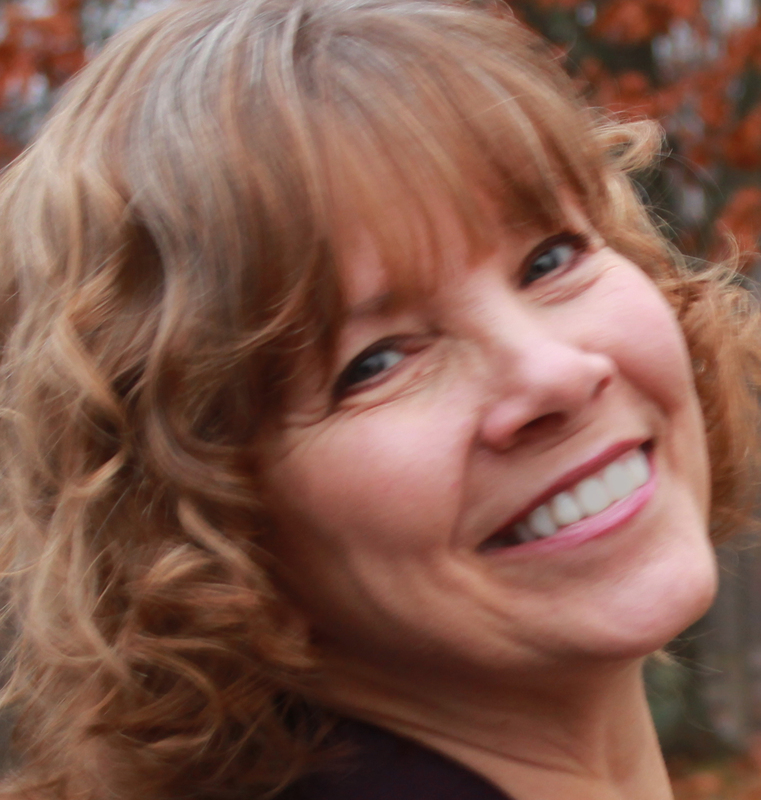 On Facebook - Allison’s Gourmet is on Twitter, Pinterest, and has a blog. They are an organic, vegan and fair-trade Bakery, Confectionery, and Chocolatier; offering vegan sweets of every kind including baked goods, artisan chocolate truffles, fudge, caramels, toffee, brittle, peanut butter cups, peppermint crème patties, and elegant gift baskets. 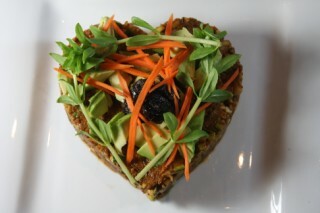 Allison’s Gourmet is a consciously vegan company supporting compassionate living one bite at a time. They never use palm oil. They use all organic ingredients, including sugar, and bone-char refining is not allowed for certified organic sugar. The company is owned by a vegan woman; Allison Rivers Samson. Allison opened AllisonsCookies.com, in 1997. Through the ensuing years, she continued to add more top-notch exclusive creations like vegan brownies, vegan caramels, vegan toffee, artisan vegan chocolates and more. Naturally, Allison’s Cookies grew into Allison’s Gourmet. 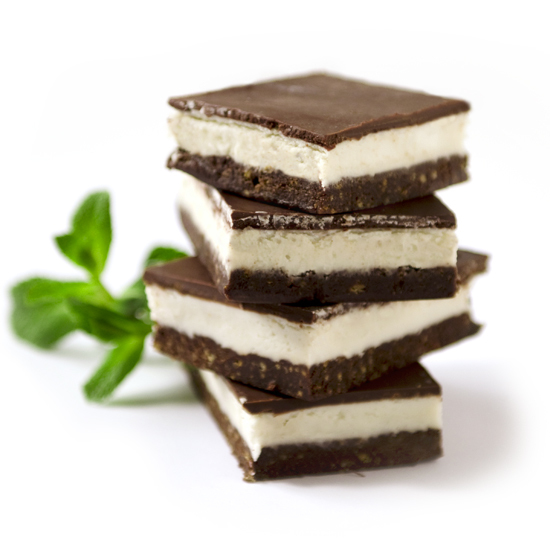 In 1989, Allison dove into experimenting with vegan dessert recipes. Allison knew that she could find a way to make all the sweet things she loved without using animal products, highly refined sweeteners, and unpronounceable ingredients. In 1997, after refining her skills through chef training and perfecting her recipes, Allison was ready to please the palates of discerning dessert lovers everywhere. The Vegan Tart - www.thevegantart.co.uk - Location: London U.K. – vegan baker/caterer – “The Tart with a Heart” offers a wide assortment of cakes and novelty cakes, such as lime and thyme cake, lavender cake, and avocado cake. The cakes are sold online and at markets. Some products contain palm oil. Owner: Dumisani Nyathi, a vegan himself, wanted to produce cakes at an affordable price so people who aren't vegan wouldn't be afraid to try. He’s been in business over a year. Ms. Cupcake - www.mscupcake.co.uk - Email: info@mscupcake.co.uk – Location: London, United Kingdom. Ms. Cupcake is a bakery and shop, and online sales. 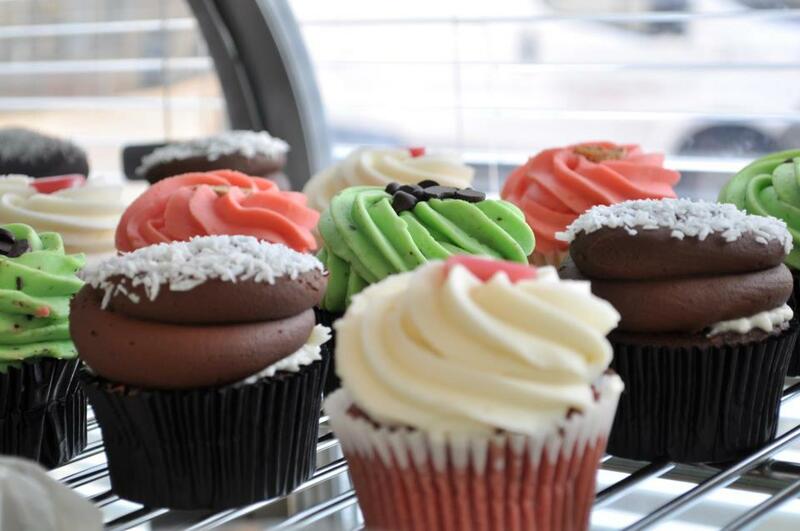 They are a decadent American-style vegan bakery offering cupcakes, layer cakes, cookies, tray-bakes and savory items. They’re London’s first entirely vegan bakery - even the products they use to clean the shop and equipment are all vegan and not tested on animals. They use The Vegan Society trademark on their products. Some products contain vegetable oil that may contain palm oil. 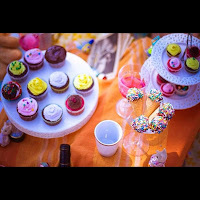 Ms. Cupcake; none other than Mellissa Morgan, wanted cakes she could eat as a vegan, but couldn't find any in the U.K., so in April of 2010, she started the business as a small home business, and it has grown exponentially since. She is the winner of the Rising Star 2011 British Baking Awards. 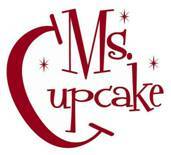 Ms. Cupcake is owned and operated by vegan staff. 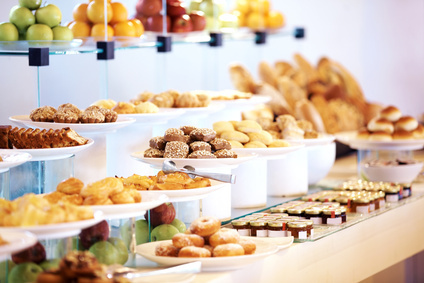 Everything is baked and decorated fresh onsite in front of the customers each day. The menu features cookies, squares, layer cakes, muffins, donuts – but they are renowned for their over 100 seasonal varieties of cupcakes. Start planning your trip to London! The Vegan Cakery - www.vegancakery.com – Email: thevegancakery@aol.com – Location: Leicester, England. The Vegan Cakery is a brand, sold online. They intentionally sell only vegan cakes and treats. No palm oil. Vegan-certified by The Vegan Society. The company is vegan owned (by Marc Orme) and operated. This 4 month young business was inspired by the need for more vegan cakes and treats. 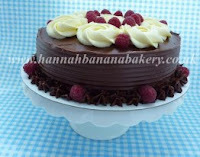 Vegan Cakes - www.vegancakes.com.br - Vegan Cakes is an on-line sales only cake shop in São Paulo, Brazil. They offer cupcakes, cakes, brownies, cake pops and snacks. Totally vegan, no palm oil, owned and operated by vegan staff. Vegan Cakes is a cake shop specializing in vegan sweets. It was created in May 2011 by Cristina Maejima, who always dreamed of uniting a passion for veganism with creating candy. For a year and half they’ve offered custom cakes. Mighty-O Donuts - www.mightyo.com – Email: info@mightyo.com - Location: Seattle, WA., USA – Ph. 206-547-0335. A wholesale/retail bakery. They deliver daily to over 100 local accounts and distribute nationally to selected natural grocery stores. They do Donuts; cake and yeast raised donuts - and have recently been certified as an organic bakery by OTCO. The wholesale donuts are certified non-GMO, as well. All their donuts are vegan, however their café is not vegan as they offer dairy milk for customers of the café – they also offer vegan coffee drinks. They say “We take great care to keep our vegan and non-vegan utensils/milk pitchers separate from each other.” “Our donuts are intentionally vegan.” They inform me that “Our palm oil is sourced from Agropalma which has a policy of never replacing forest with plantations. They have reforested 185,000 acres of previously cultivated land which consequentially led to the rehabilitation of 7 previously endangered animal species. They are also certified organic by the USDA.” When asked if they use white refined sugar (often not vegan in the U.S.) they responded “No. Owner: Ryan Kellner, worked very hard to find a vegan source for our sugar and powdered sugar so we would be able to continue to offer our donuts to the vegan community.” The inspiration behind Mighy O donuts: “Experiencing the Northwest culture, the burgeoning organic food movement, and sharing thoughts with our friends and community, we were inspired to create an organic donut. We couldn’t find anyone making a donut the way we envisioned. A sweet treat with no chemicals, no genetically modified organisms, and no animal products—something everyone could enjoy.” They must be good because they’ve been in business since May 2000. Lagusta's Luscious – www.lagustasluscious.com - 25 North Front Street, New Paltz, N.Y., USA - Those lucky people in New Paltz; they live near an organic and fair-trade 100% vegan chocolate shop. You can see all their products here. No palm oil or white refined sugar. Since 2003, “our mission is to make beautiful treats without compromising our values. We're happiest when people have no idea that things are vegan or organic until long after they've tasted them, because that means we're changing people's minds about how food that's produced in an ethical way tastes” says owner Lagusta Yearwood. Lagusta says “I've been vegan since I was 15, so it'll be 20 years next year. I did a lot of animal rights work in high school, and feel happy that having a vegan chocolate shop is a good sort of "pleasure activism" for me.” The staff is mostly vegan. They also make and sell a few savory foods like tempeh, miso and some infused vinegars. Veganitessen - www.veganitessen.es; is an artisan and vegan bakery in Seville, Spain, but they also offer breakfasts and brunches. The shop is a retail storefront sited in a food market, but they also sell cakes, sweets, pies, etc. to restaurants and other shops. They specialize in vegan cheesecakes and cupcakes. They sell exclusively vegan products to vegan and non-vegan people. “We think that offering delicious vegan food is the best option to help the non-vegan people know veganism” explains the owner: Anabel Reyes. Anabel is the only one working at this business; so she can say it’s vegan owned and operated! Anabel explains the inspiration behind Veganitessen: “It was a necessity in Spain to have a vegan business like this. 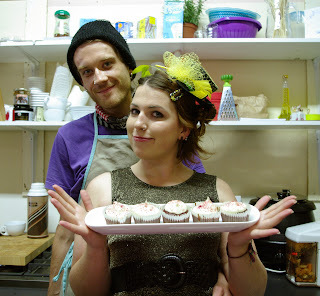 We were the first vegan bakery in this country, and we are proud of it!” No honey. No palm oil. Veganitessen has been opened since summer of 2009. Nicobella organics - www.nicobellaorganics.com - Email: info@nicobellaorganics - Location: L.A., CA., USA - Ph. 866.613.8679 - An online business offering vegan, organic and fair-trade chocolate truffles and dark chocolate covered nuts; all made with whole food ingredients. No palm oil or white refined sugar. 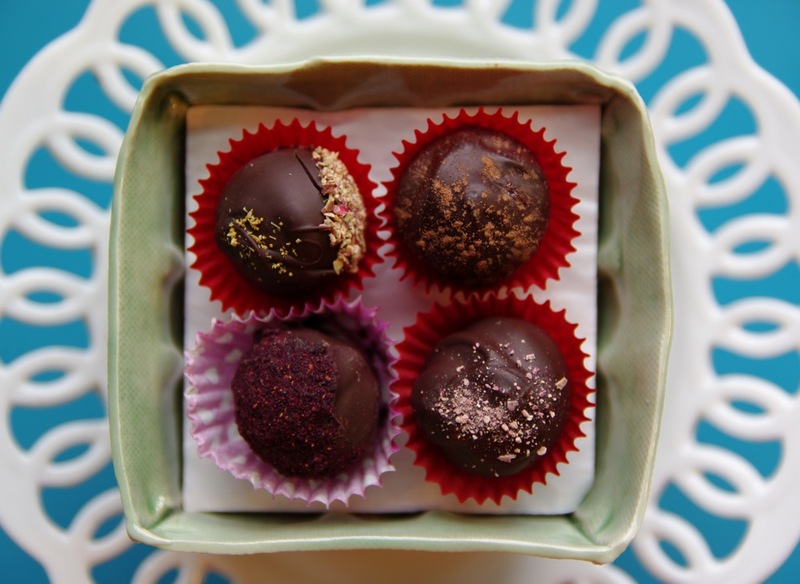 Owner; Nichole Dandrea, wanted to offer a healthier and animal-friendly, yet tasty, alternative to traditional truffles.This vegan owned and operated businesses was started in 2009. The company name is a combination of half Nichole's name and half her dog friends's name: Isabella. Eat Pastry - www.eatpastry.com - Email: info@eatpastry.com - Ph. 858.228.6506 - Location: San Diego, CA., USA. 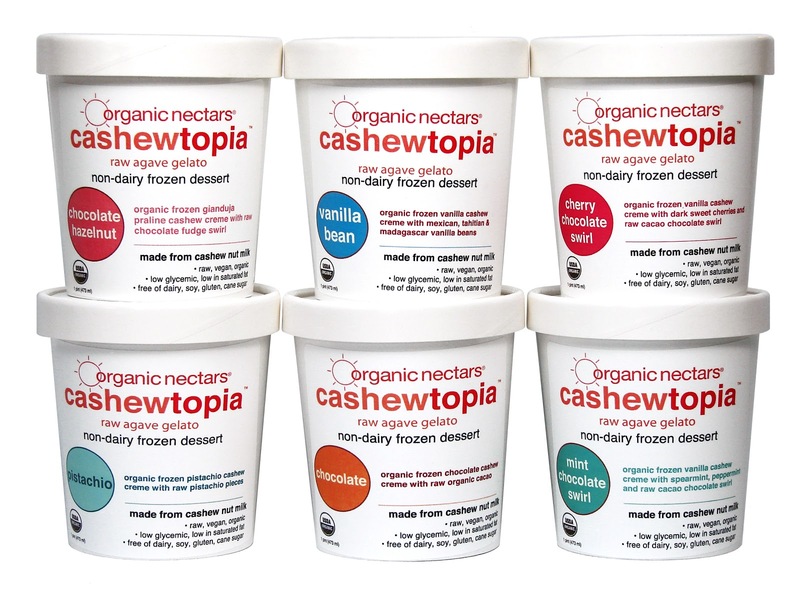 They're a manufacturer; offering 7 flavors of vegan cookie dough, 3 of which are also gluten free! 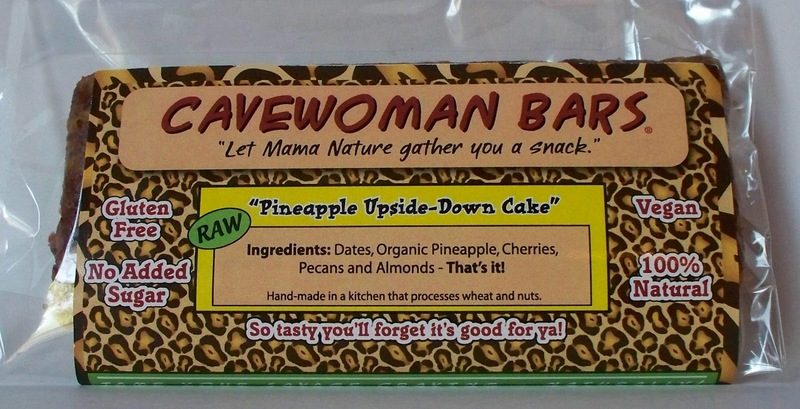 Find this product in the refrigerated section of natural grocers across the U.S. Owners; Jessie Williams and Alfredo Elias were inspired to start this business in 2009 because of their love of sweets, baking, and their vegan lifestyle. The vegan owned and operated business is staffed by people all under the age of 30. Viva La Vegan Grocery - www.vivalavegangrocery.com – Ph. (909) 941-1892 - I never thought there was a real place called Cucamonga, but there in Cucamonga, California, U.S.A. lives a retail (and online) 100% vegan grocery store. Their products do not contain any animal-derived ingredients including bee products. No products were tested on animals. Co-owner; Isaak Iftikhar, informs “We are the largest all vegan grocery store on planet Earth.” Isaak continues “We have written into the articles of incorporation that Viva La Vegan Grocery shall never sell/profit from any products or services that are not vegan. 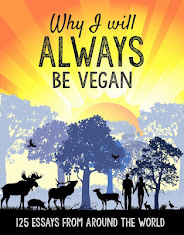 Viva La Vegan Grocery was established for the sole purpose of ending the unnecessary suffering and exploitation, the adversities to our natural environment, and the impact to human health as a result of the consumption and use of animals. We facilitate the transition into a vegan lifestyle by making products and shopping convenient and affordable. We plan to make a vegan lifestyle accessible to as many people as possible. Our store gives living form to the ethical idea that a grocery store can be free from all animal products. Any economic gain from the revenue/profit is for the primary purpose of advancing Veganism and not for personal concentrated wealth. We support vegan principals as they prevail over self-interest.” A business like this vegan-owned and operated grocery store inspired by animals and the environment – makes Cucamonga a point-of-interest! Bliss Organic Cafe and Market – Adelaide, South Australia - Ph. 08-8231 0205. This cafe/restaurant, and a store with a beautiful garden to relax in at the back, does sell some products online, and also offer catering services. The menu consists of awesome meals like Tofu Scramble, Bliss Burger and Tangy Tofu Salad. Bliss offers a variety of products from groceries, books, CDs/DVDs, homewares, household, raw products to clothing, wallets and shoes. Bliss sells and makes only vegan products, intentionally – “No other way for us” as they put it. Regarding their stance on palm oil, “There are a few items with palm oil (cheese, yoghurt) that Bliss has been stocking for a while. They are labeled and Bliss is slowly removing them from the shelves, too. We had some success in manufacturers removing palm oil and replacing it with alternatives. We already removed all cosmetics/soaps with palm oil from our vegan range.” Grace Love and Shane Ward are the owners of Bliss Organic Café and Market; and they are vegan. Grace and Shane say “We wanted to offer a place in Adelaide that feels like home and serves organic vegan food; locally produced whenever possible, sustainable, friendly atmosphere, a place to go whenever one feels like being at home without the need of cooking and cleaning afterwards.” They have been bringing bliss to customers for 3.5 years and they have live music on Friday nights and Saturdays. They also offer cooking classes, movie screenings, talks, dance sessions, yoga upstairs; the owners believe in sharing the love through food and education. 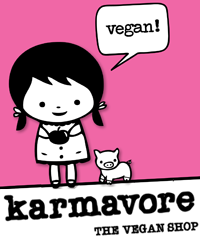 Karmivore - Email: info@karmavore.ca - Location: New Westminster, BC, Canada - Ph. 604.527.4212 - This Specialty Shop and Cafe offering specialty goods, in-house baked goods, restaurant, cosmetics, footwear, animal rights shirts, buttons, jewelry and much more, is vegan-owned and operated; in business since 2008. Their inspiration - animal rights. In response to whether they carry products containing palm oil that displaces orangutans and wildlife, they replied "Yes, but that's not the only product that does this, and not all palm oil is extracted or produced in the same way. The majority of deforestation and displacement of wildlife is caused by factoring farming, requiring the clear-cutting of forests to grow soybeans and other products for livestock feed." They explain their position of products that have been tested on animals: "All products must not be tested on animals, not just the finished product, but also the source ingredients. For example, some will sell products that contain chemical food coloring which has been tested on animals, we do not." Visit Karmavore on Facebook and Twitter. The photo is their stickers they put on purchased packages. Evolution Fast Food - Location: San Diego, CA., USA - Ph. 619-550-1818. Evolution Fast Foods offers Burgers, Fries, Shakes, Salads, Wraps, Fresh Juice, and Desserts. Evolution Fast Food, LLC is the owner and the staff is mostly vegan. I love Mitch Wallis’s response to the inspiration behind starting this business: “to save the world”. They’ve been in business approximately 3 years and they produce and host many vegan community events also. It is stated in both their logo and on the website that they are vegan. Plum Restaurants (5 of them) - www.plumbistro.com - Plum Bistro - Seattle, WA. USA - Ph. (206) 838-5333. Plum Market - Seattle, WA. - Ph. (206) 428-6337. Plum Café - (Formally known as Sage Bakery and Cafe) in Seattle, WA - Ph. (206) 325-6429. Hillside Quickie - Seattle, WA - Ph. (206) 632-3037. Quickie Too - Tacoma, WA. - Ph. (253) 572-4549. Makini Howell; the owner of these 5 (above mentioned) restaurants has been eating a plant-based diet her entire life, apparently. 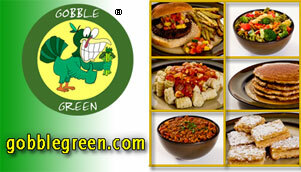 They are developing wholesale products to sell online and to grocery stores and restaurants. To quote Adam Williams “Plum offers a variety of vegan dishes and products at our restaurants. We want our love of a plant-based diet to be the embodiment of the change we are all going to meet in the coming years, with regards to how we harvest food and how we treat our host planet. We have worked to develop a sustainable business model using what the earth provides to supply wholesome nourishing food to our community; Plum’s food is honest and straight forward, yet remarkably forward-thinking. It tells the story of life-long vegans, and it’s made and served by a group of people who love the space they are in.”…“We are bold and sophisticated, yet through our promise to do no harm to our animal neighbors, peacefully extend to you all of the bounty and beauty of the earth.” Plum’s been in business since 1972! Hibiscus Wilde, Dublin, Ireland's first 100% Vegan food bar. Operating since August 2012 - Contact via Facebook: www.facebook.com/hibiscuswilde or Email: hibiscuswilde@gmail.com - A very intentional vegan food bar with sit down eating and takeaway options. 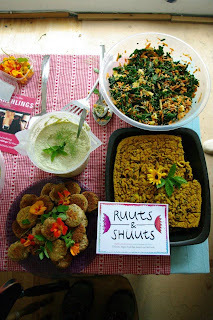 The Hibiscus Wilde menu currently offers lentil burgers, salads, sandwiches, soups, falafel, organic homemade muesli, cupcakes, cakes, some raw and sugar-free deserts, smoothies, juices, teas, chicory, and vegan sushi. The food is homemade and all ingredients used are organic when possible, free from preservatives, artificial colors or flavors. They aim never to support the use of palm oil. Owner; Laura McGlynn says “Our peanut butter cupcakes for example are made using palm oil free organic fair trade peanut butter. Delicious! And devastation free.” They use demerera/muscovado brown sugars, unrefined, and other sweeteners such as Agave syrup, Maple syrup, molasses, stevia and xylitol. Laura assures us “No we do not want to use any products tested on animals or support any form of vivisection.” Laura explains that her inspiration was “the longstanding need for a wholly vegan food place in Dublin. Being Vegan myself, I felt this longing and decided to just do it! Not only for all others within Dublin, Ireland’s vegan community, but also to show non-vegans how easy and awesome vegan food can be! Also, to win everyone over with yummy vegan cupcakes of course.” Based within an indoor bohemian bazaar style market; it's a great hangout place. 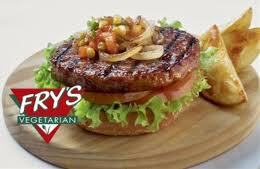 Fry’s Family Foods - www.frysvegetarian.co.za - Email: brett@frygroup.co.za - Location: Westmead, Durban, South Africa – Ph. +27 31 940 7798 – This manufacturer of vegan meat analogues: hot dogs, burgers, strips, pies etc., sells both online and at retail outlets. Wally Fry is the owner. They're certified by The Vegan Society, U.K. Since 1991, the business is driven by the family’s passion to create delicious, cruelty-free food that has as little impact on the natural environment as possible with emphasis on putting principles over profits. 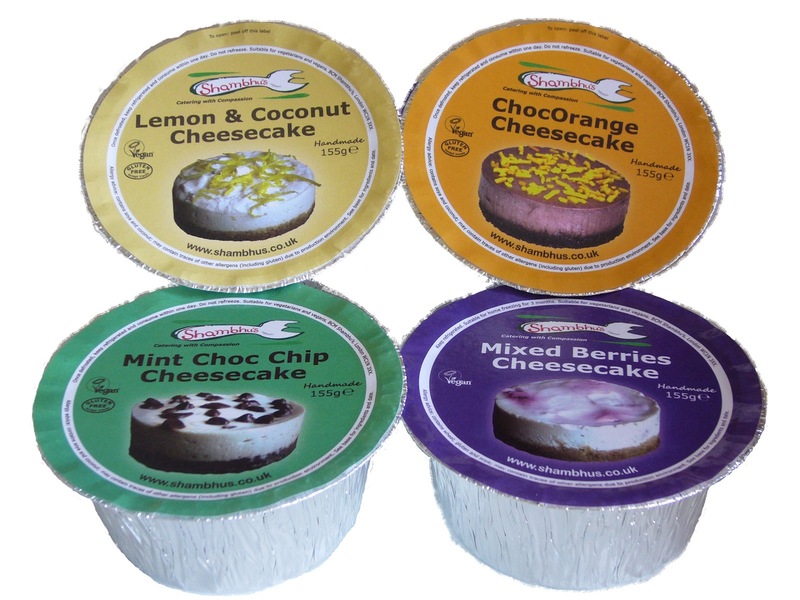 Vegusto UK LTD - www.Vegusto.co.uk – Location: United Kingdom - Ph. 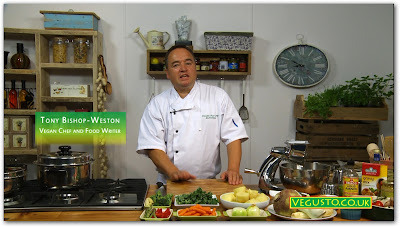 01273 936010 – Vegusto is a business of food production and distribution. They sell online, and through health stores, and they supply restaurants and catering companies. They offer 8 flavors of dairy free, palm oil-free, cholesterol-free cheese, and up to 40 wheat based meat alternatives including burgers, sausages, steaks, sandwich slices, etc. All Vegusto products are 100% vegan, natural, GMO-free, and no artificial colors, flavors or preservatives. Vegusto are certified by the UK Vegan Society. 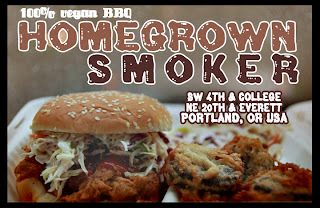 The owner is Mark Galvin; all owners and staff are vegan. 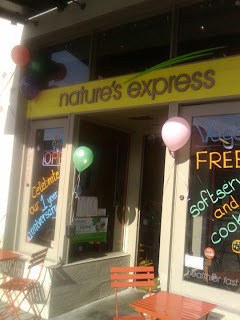 For 15 years they have been providing great-tasting vegan food. Good Karma Foods - www.goodkarmafoods.com – USA – This branded natural foods company sells on line and at natural food stores and supermarkets in the U.S. and Canada. They offer the world’s first flax-milk and organic whole grain rice-milks. They are also Non-GMO Project certified. Their products are marked “vegan” as a bullet point. Loren Wallis, President, is a vegan. Dan LaValley is the CEO. 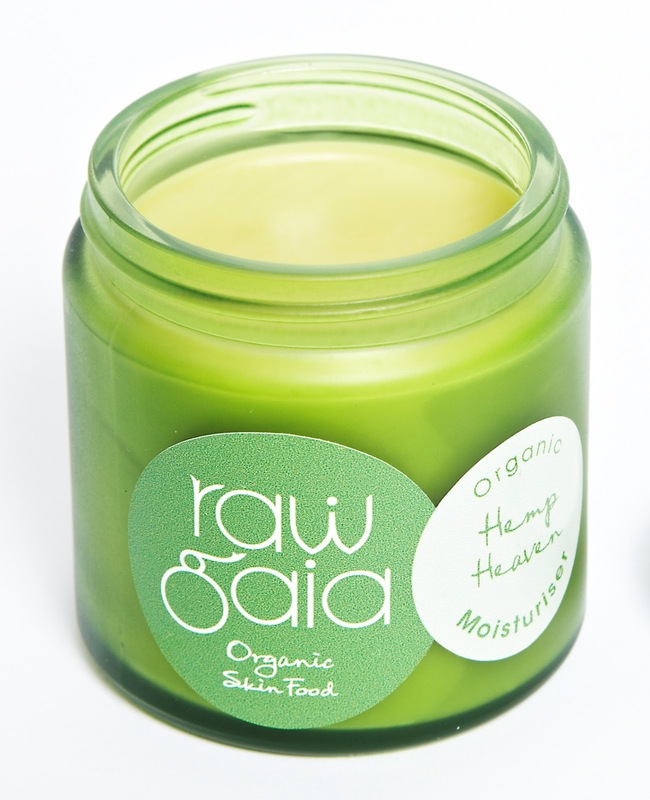 Their inspiration was to launch Vegan, Natural and Organic Products – founded in May 1996. Location: N.Y., USA - Ph. 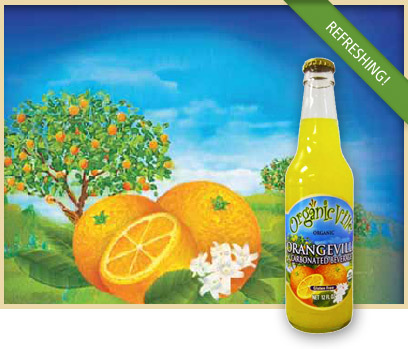 845.246.0506 - Email: customerservice@organicnectars.com – They describe themselves as a boutique manufacturer. They sell online and wholesale to other physical and online retailers, such as Whole Foods and Amazon.com. They create and produce gourmet organic, vegan, mostly raw, gluten-free, low-glycemic, non-GMO gelato, sorbetto, chocolates, sweeteners and superfood ingredients. Their inspiration was to produce gourmet-quality sweets and ingredients that are healthier, more environmentally-friendly, and friendly to animals. In business for 7 years, Organic Nectars was the first company to produce and market an agave-sweetened frozen dessert. They’re also the first company to have a nut-based frozen dessert in national distribution. And they inform us that they’re the first to have a coconut sugar sweetened line of chocolate bars. Mary’s Gone Crackers - Gridley, CA. –USA. - Ph. 888-258-1250. (In Canada they're Mary’s Organic Crackers - www.marysorganiccrackers.com. 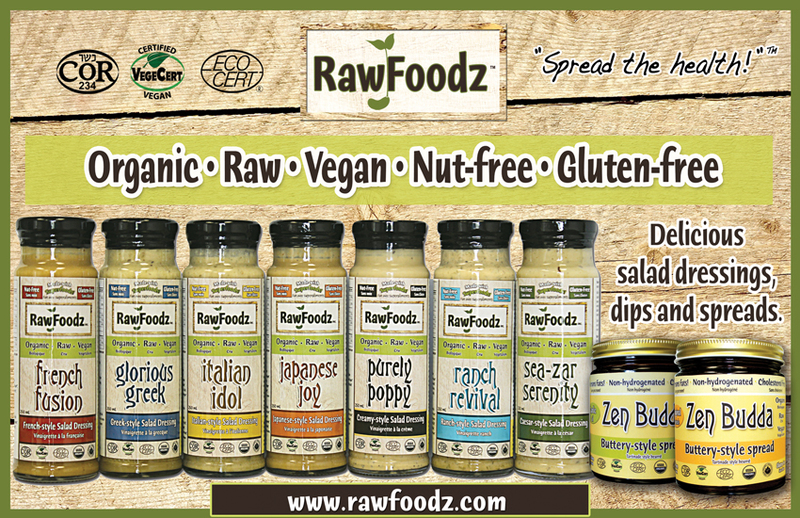 They are a manufacturer of gluten-free, organic, vegan food that is certified gluten-free, organic, in a kosher facility. They sell online and are distributed in retail stores all over the US and Canada, offering crackers, pretzels, and cookies; all gluten free, vegan, organic and delicious! Mary Waldner, co-founder, explains “Our crackers and pretzels are vegan by nature of the ingredients used. Once we started making cookies, the decision to be a vegan company became more intentional.” They do use palm fruit oil that Mary says “is sustainable and part of the consortium that’s committed to source palm oil in a way that does not destroy rain forests.” This business of over 200 employees is not vegan owned and operated, but all product packaging says ‘vegan’ on it. Organicville - Location: Emeryville, CA., USA – Ph. (510) 655-1755 - A product line that is certified organic, gluten-free, dairy-free, vegan, no added sugar, and tastes great too! The company owner; Rachel Kruse is a third generation vegetarian who has never eaten animal products. They offer numerous salad dressings, sauces, ketchup, BBQ and Teriyaki Sauce, Agave Salsa, and sparkling citrus beverages. Conscious Cuisine/Bounty Burgers - www.bountyburgers.com.au - Location: Australia - Ph. 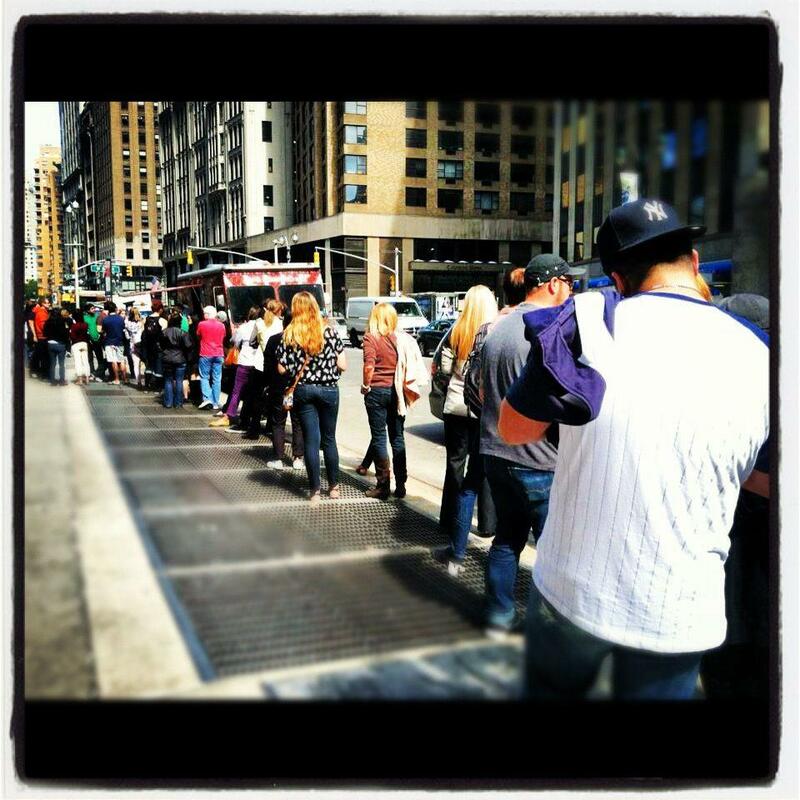 0421 202 555 – They are a manufacturer that wholesales to retail shops; offering pre-cooked, gourmet frozen soy burgers. No palm-oil. This totally intentional vegan business is owned by Loren Lembke. Loren shares her inspiration: “As a long-term vegan, I was over having to 'doctor' the taste of many products so that I could eat them. 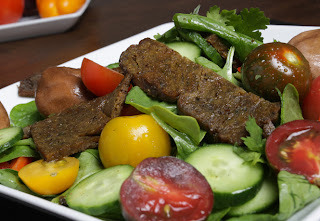 I wanted a delicious, healthy product that actually rewards vegans - and seduces meat eaters. 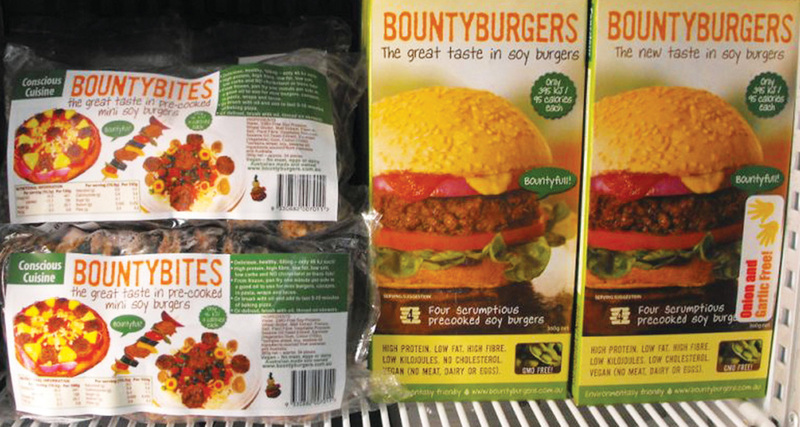 In business since 2008, Loren tells us “We love doing in-store tastings where we witness the surprised and happy responses from many mainstream consumers.” I enjoyed Bounty Burgers when I visited Australia! VeggieBrothers.com – is a unique manufacturer of over 150 gourmet chef made vegan dishes, sold online and shipped anywhere in USA and Canada. They have a food service line for businesses (restaurants, pizzerias, colleges, etc.) offering vegan versions of America's favorite dishes; from chicken pot pie, to beef wellington, from beef teriyaki, to French toast. Owner; Michael Baldulcci, informs us that his business is “100% vegan-owned, vegan operated-mostly (but I’m doing a good job on the converting - no one does it better than me and my products).” VeggieBrothers has been in business since 2005. They source out vegan, organic and non-GMO ingredients. Michael had a vision to help people enjoyably transition into a healthier and sustainable plant-based diet. Eager to give people lots of variety, he sought the most brilliant vegan chefs and the greatest recipes he knew everyone would enjoy, whether they were vegan or not, to introduce to others the guiltless pleasure their special vegan cuisine can offer. They provide customers with effortless access to vegan dining anywhere in the USA, via their vegan food delivery website. Part of their mission is to educate about the benefits of a vegan diet such as spiritual (karma), non-violence (ahimsa), animal rights and compassion, physical health and medical science (humans do not need meat to survive), global and environmental health, and socio-economic reasons through web links, articles, e-books, newsletters, affiliations and other practical means. The Vegg LLC - www.thevegg.com - Email: rocky@thevegg.com – Location: Stroudsburg, PA., USA - Ph. 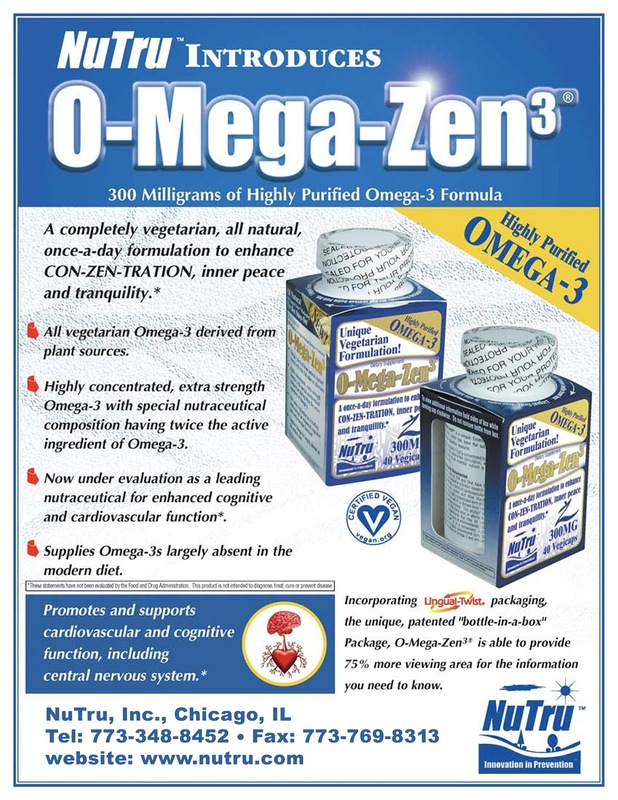 (570)460-2139 – The Vegg is a manufacturer and wholesaler of a powdered vegan egg yolk, sold online. It’s a one person business owned by Rocky Shepheard, who is vegan. In business since the 1st of January, 2012, Rocky wanted to create a product to draw business away from the egg industry, and also to provide a product to help vegetarians/omnivores considering veganism not have the egg excuse anymore. He invented the world’s first vegan egg yolk! Tree Nut Cheese Corp., also known as ‘dr-cow’ - www.dr-cow.com – Email: info@dr-cow.com - Location: Williamsburg/Brooklyn/N.Y., USA – They’re a manufacturer of cheeze nuts and biscotti’s, and granola's. In business since 2005, the CEO is an excellent pastry chef; she worked in many of the best restaurants in NYC. Products are clearly marked as vegan. Ethical Bounty Gourmet Nut Butters www.ethicalbounty.com - Location: Pompano Beach, Florida, USA - Email: contact@ethicalbounty.com – cs@ethicalbounty.com - Ph. 954-621-5676. Ethical Bounty is an internet retailer/mobile food vendor that ships nationwide, as well as offering products locally in South Florida at farmer’s markets, local retails stores, etc. Owner, Founder: Katherine Botelho, says “For now, I'm an "Army of One". Once I'm able to expand the business however, I will be opening up opportunities for vegan employees only.” She continues “I craft organic raw nut butters in varieties not offered in a typical retail store. These products are not mass produced, but crafted in small batches. There are no added oils, salt, or sugar added to any product. The unique stone grinding method used insures that the products never reach temperatures exceeding 115 degrees (typically far less), thus maintaining the nutrients, and living enzymes present in the raw nuts. Products offered include a truly raw Almond Butter made from unpasteurized Italian almonds, and my most popular item; the slightly spicy, mildly sweet (from organic raisins) Cinnamon Raisin Cashew Butter.” Katherine assures me “The products are intentionally vegan. 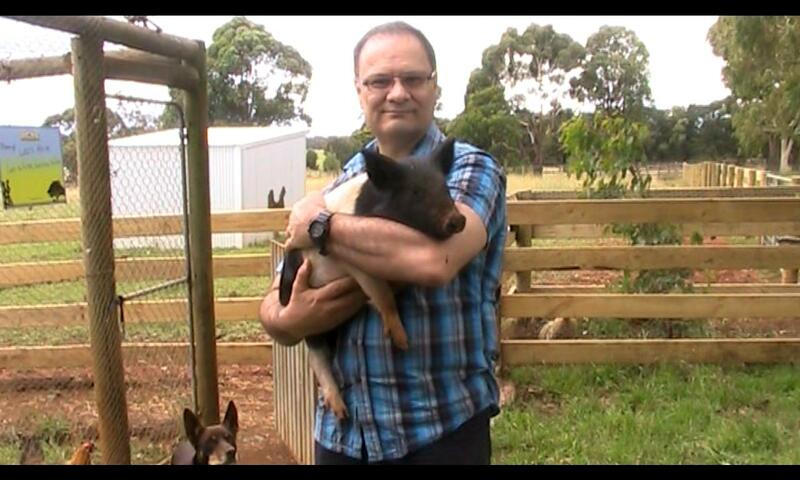 As a vegetarian of 28 years (since 1976), and now vegan of 8 years (since 2004), I am living proof that one can not only survive, but thrive happily by living a vegan lifestyle. I clearly and proudly label my products as vegan.” Responding to my palm-oil question, Katherine says “I'm anti palm oil, and boycott any products that contain it, as I've seen no evidence that there is such a thing as ethically obtained palm fruit oil. I'm actually experimenting with creating an alternative to a wildly popular palm oil based "buttery spread".” Ethical Bounty has been selling online, and shipping nationally since 2009. Nothing is pesticide tainted, or GMO. Katherine remarks “I played "mad scientist" in the kitchen, developing flavors such as Banana Walnut, Cherry Pistachio, and Cinnamon Raisin Cashew. Daiya Foods – www.daiyafoods.com – Located in Vancouver, BC, Canada; Products available across U.S. & Canada - Email: cr@daiyafoods.com or contact via Facebook and Twitter. 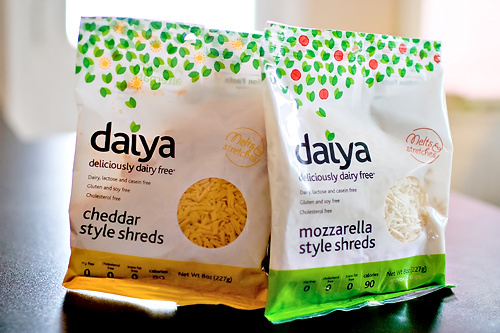 Daiya is a food processor and manufacturer with their own facility in Vancouver, BC to ensure products do not undergo cross contamination. They offer 2 types of vegan cheeses (shreds or wedges) in 3 flavors each. 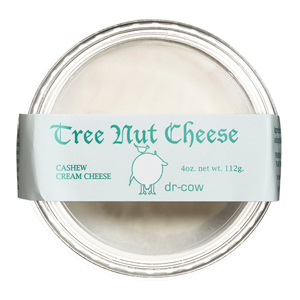 All products are dairy-free, soy-free, gluten-free, and contain no nuts except for coconut. Daiya co-founders (both vegans) intentionally wanted to create a cheese alternative that melts like and tastes like cheese, after being dismayed with what was currently on the market. 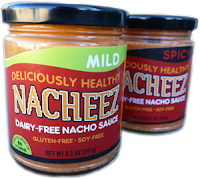 The whole vegan community is thrilled, as they have made excellent tasting vegan cheese! Their wedges do contain some palm oil but are sourced from sustainable sources in Brazil, which is not a habitat to orangutans. You can find the Vegan Action (vegan certification) logo on all Daiya products. Co-founders & CEO’s are Andre Kroecher and Greg Blake. Daiya currently employs over 50 employees, not all of which are vegan. Everyone is however open-minded and respectful to the company’s core of ethics. TThey'vebeen in business since 2007. Alivia Prattas; Daiya Brand Ambassador, reports that their products have been featured on the Oprah Winfrey’s and Ellen DeGeneres’s shows, and they’re still a privately owned company. 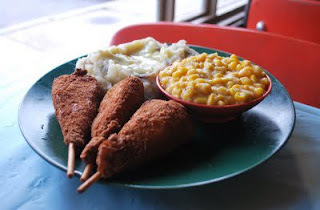 Foods Alive - www.foodsalive.com – Location: Waterloo, IN., USA – Ph. 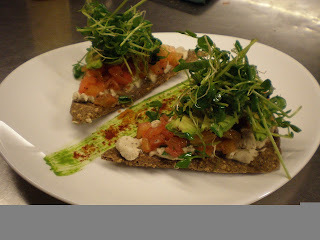 260-488-4497 – Foods Alive is a manufacturer offering Organic Flax Crackers, Artisan Cold-Pressed Oils (Flax, Chia, Hemp, Black Sesame), Super Dressings, Super Foods (Chia, Hemp, Maca, Goji) They are certified vegan by Vegan Action. Since 2002, they have been offering healthy whole foods. Lydia’s Organics – Location: Petaluma, CA., USA – Ph. 707-765-9200 - Founder, Owner and Operator: Lydia Kindheart – Email: Info@lydiasorganics.com - They have a storefront, online store at website, and sold in retail stores. 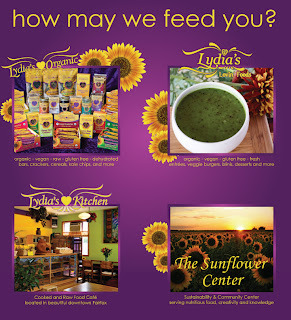 Lydia's Organics is a dried food line available nationwide. 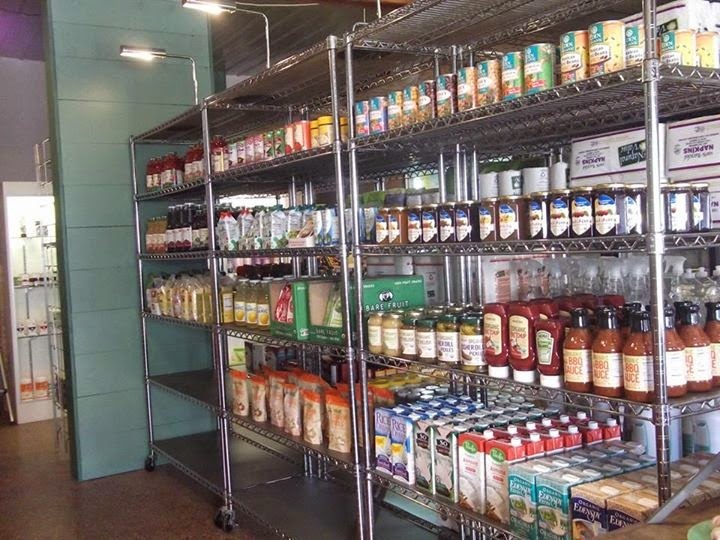 Lydia's Lovin’ Foods is a fresh food line serving the SF bay area – Ph. 707-792-5302 - Lydia certainly keeps busy as she also operates The Sunflower Community Center and Restaurant - Ph. 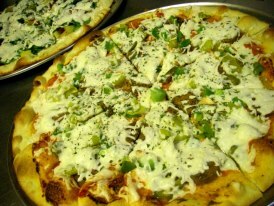 707-792-5300 AND Festivals and events along the West Coast from Oregon to L.A. – www.lydiaslovinfoods.com/fairsfests.html - Ph. 707-792-5304 – Lydia runs a Community Center, Restaurant and is a manufacturer; selling wholesale goods both fresh and dried; organic, vegan, gluten-free, raw & cooked. 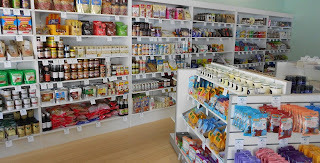 In stores, she offers shelf stable-cereals, bars, crackers and refrigerated products like salads, entrees, pate`s, desserts, and alkalizing soup. The Restaurant and festivals offer a large variety of dishes. Her motivation is in having a positive effect on a planetary level through what we eat. She started out 17 years ago, as a small deli type retail frontage and has gone through many transformations through the years. 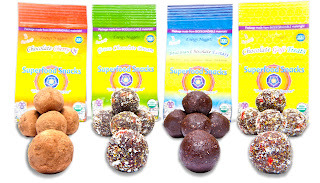 Superfood Snacks Inc. -www.SuperfoodSnacks.com Location: Lihue, HI., USA –Ph. 1-866-771-5683. 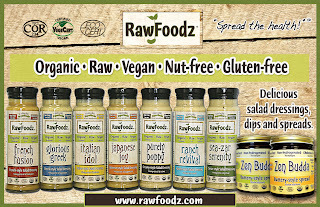 They are a manufacturer of Vegan and Organic Raw Food Energy Snacks; sold at various health food stores around the country, including Whole Foods Market, as well as online sales. Products include raw chocolate based fruit, nut and seed energy snacks; organic and superfood based! The company intentionally only sells vegan foods, and the product is marked ‘vegan’. They are vegan-friendly, but owners are not pure vegans. In business since 2007, and they print and package their packaging on materials that are certified biodegradable and compostable. They insist on sustainability. Hail Merry Snacks and Desserts - Hail Merry is a national brand; sold at Whole Foods Market, natural food specialty stores as well as airports, hotels, stadiums, universities, and medical centers. They have an Internet storefront, too. Hail Merry manufactures vegan, gluten-free, dairy-free and kosher snacks and desserts; products include: granola, seasoned nuts and seeds, cookies (macaroons), and tarts. Hail Merry is a women-owned business based in Dallas, Texas, USA. They use coconut oil but, but not palm oil. They tell us "We use organic palm sugar which is also called coconut sugar. I don't know if any orangutans have been displaced by our use of this product." 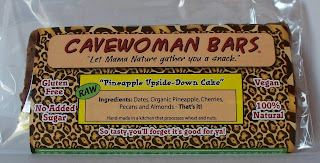 This vegan company started, they tell us, "in Maui where Founder, Susan O’Brien fell in love with the raw food lifestyle. 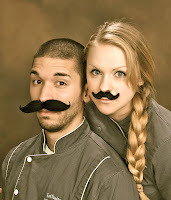 Her curiosity took her to California where she trained with raw food chef, Juliano. Returning to Dallas, she transformed her cabana into a test kitchen for raw snacks...She wanted to help others reach her level of health and happiness. Hail Merry quickly gained a devout following of vegan, gluten free and raw enthusiasts who all share a love for fresh, plant-based, whole foods which heal the body." From CEO Sarah Chapin: “Working as an executive in the public and private food industry for more than 20 years, I realized I was not healthy. I knew my body was not working at its capacity. That’s when I began my journey for improved health and wellness. That significant declaration of love for my own body led me to agree to lead Hail Merry when it incorporated in 2009. At Hail Merry we seek to heal people through life-giving foods." 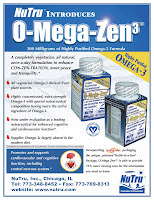 www.VeganProteins.com - is an online one-stop vegan supplement shop. Location: MA., USA- Email: veganproteins@yahoo.com -This store offers a variety protein formulas, energy bars, green superfood blends, and vegan fitness apparel. They only sell cruelty-free - vegan products that are also gluten and soy free. Being vegan is intentional and part of their core vision, and therefore there is no honey or white refined sugar in their products; that are never tested on animals. Products have a vegan stamp on them. Giacomo Marchese and Dani Taylor are co-owners who collaborated with fellow members of VeganBodybuilding.com to provide a service that they saw did not exist. In business for over 3 years now, Giacomo and Dani package up orders in reused boxes sourced from local stores and their recycling center. Everyone who orders from them receives a handwritten note, a hand-decorated box with drawings, and extra products to try out. The Vegan Vine Wines - www.theveganvine.com – Email: cheryl@clos.com – Location: San Martin, CA, USA – This vegan winery offers four wines under The Vegan Vine, a Sauvignon Blanc, Chardonnay, Cabernet Sauvignon and Red Wine Blend. They sell online and they sell to restaurants and wine shops around the country. The Vegan Vine sells only Vegan Wines, certified by Vegan Action. Cheryl Durzy tells us “We have several owners, but one of our main ones is former NBA champ, TV host and health and wellness advocate; John Salley. He is a vegan.” Cheryl reports the inspiration behind the Vegan Vine Wine “The owners of Clos LaChance Winery has a vegan family member that was asking questions about the vegan winemaking process. After a lot of research, it was determined that there was need in the marketplace for a vegan wine that was high quality and educational as well. All the details about the vegan winemaking process are included with each bottle on a necker.” The winery where Vegan Vine is made is one of the few wineries that are Certified Sustainable by the California Sustainable Winegrowing Alliance . www.veganwinesonline.co.uk – Through the website, they only sell vegan wine, online. Location: South of England. Twitter: @VeganWines. Ph. 01243 887 508 The wine retailer is not vegan-owned and operated, however they have intentionally created the online store for vegan wines. The online store began in July of 2012 that sells ONLY vegan wine. The inspiration for starting this business, in their words “Our research showed many vegans believed all wine is vegan. We could also see how poorly vegans were served when it came to wine. Our research at http://veganwinesonline.co.uk/vegan-wines/supermarkets/”. La Ishá -Therapeutic Grade Anti-Aging Organic Skin Care. Essential, Effective, Empowering Formulas Created for Women Over 35. 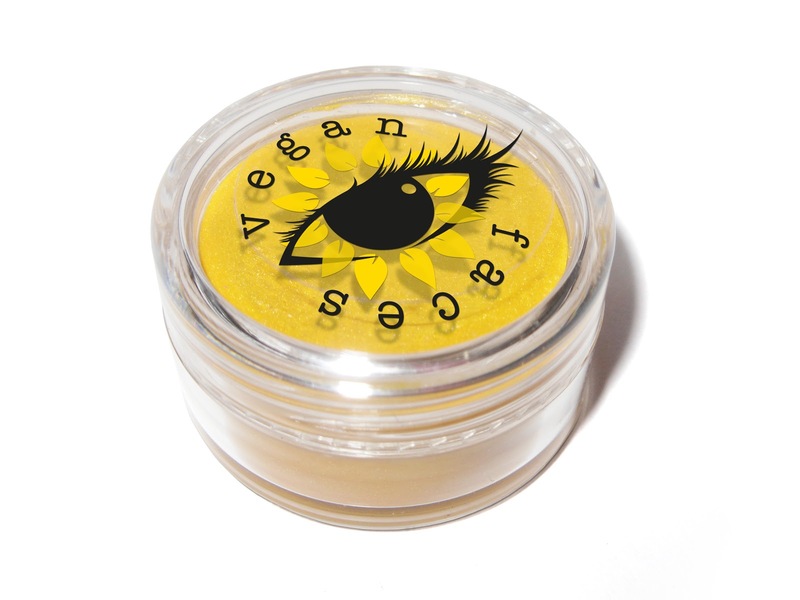 Vegan Faces - www.veganfaces.co.uk – Email: info@veganfacesuk.co.uk – Based in the United Kingdom - Sole trader - online sales offering natural face paints, mineral cosmetics and brushes. Vegan Faces explain that they are the only company selling Face Paints which are 100% Vegan - replacing beeswax with natural oils such as Organic Jojoba oil. “All products are manufactured by a cruelty-free makeup manufacturer with many ethical certifications” explains owner; Metala Theart. Metala assures us “I am vegan and therefore against animal testing. All products are free from animal testing and ingredients.” Products are certified vegan by The Vegan Society. Metala further explains her inspiration “I am a freelance face painter who spent months searching for vegan face paints - I was in contact with many vegan charities and The Vegan Society who confirmed that there were no known face paints on the market which didn't contain lanolin or beeswax, so I began to get them manufactured in 2011. Since launching the first range of face paints I have expanded with cosmetics and brushes and hope to continue with a line of skincare products.” Metala began ‘Vegan Faces’ in 2011 - and she does all the web design, copy-writing, graphic design, packaging herself, which means she doesn't currently hire anyone, therefore keeps costs low for her customers! SKIN all natural™ and Choice All Natural Inc.- www.skinallnatural.com – Email: info@skinallnatural.com – Location: Apex, NC., USA – Manufacturer and marketer of vegan skin care products and nutritional supplements; both online sales and a retail store. 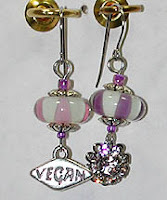 They are certified vegan by Vegan Action and certified cruelty-free (free from animal testing) by Leaping Bunny. 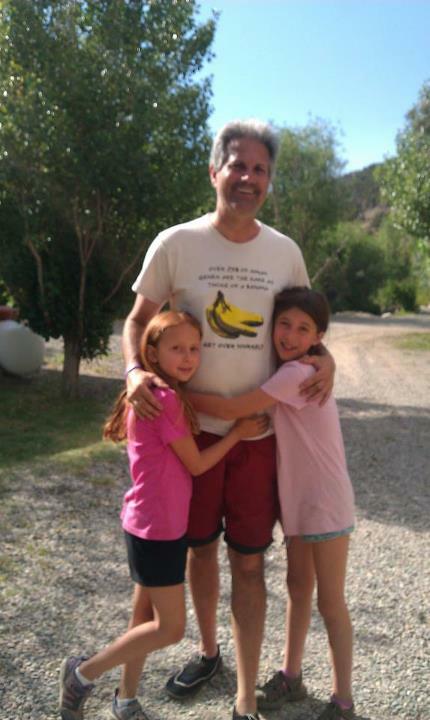 Owner; Sudhir M. Shah - wanted to offer 100% natural, plant-based vegan choices to consumers. This vegan owned and operated business has been in existence since 2010. Hope Street - www.hope-street.com - Brixworth, Northamptonshire, United Kingdom - Hope Street is an online shopping site offering organic, natural skin care and body care products that are nutrient packed and of premium quality that moisturize and care for your skin. They carefully create their own innovative recipes using botanicals rich in essential fatty acids, vitamins and minerals. Owner; Gill Whiffen explains: “We individually source certified organic and fair-trade ingredients where possible and hand-make in small fresh batches. We aim to produce a natural handmade skin care range that is affordable to buy, but which also fairly pays suppliers and workers. It is also important to us that our products reflect our concern for our wonderful planet and all the creatures sharing this amazing living space.” Gill assures us “Our products are not tested on animals and we make sure that none of the ingredients we use are either. Animal testing is an issue that we are totally against.” They’re registered with The Vegan Society and their products are labeled with a vegan stamp. Gill explains the inspiration behind Hope Street was born from a desire to create a range of skin and body care products that supported local farmers by using their organic ingredients which did not pollute our soil and environment. We wanted our money to help these people and not large profit-making corporations. Hope Street has been in business since 2009. 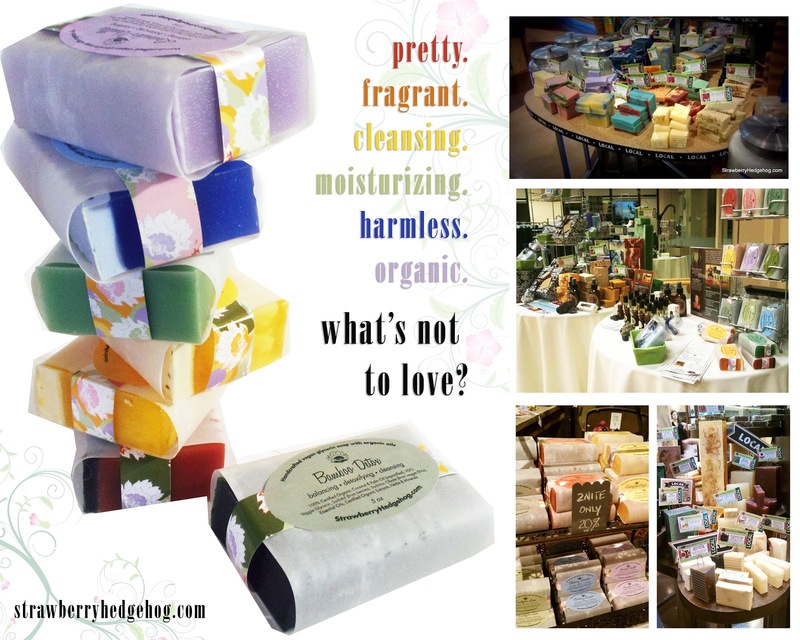 Kalliste Soap Shop - www.kallisteshop.com - Email: info@kallisteshop.com - Dobbs Ferry, NY, USA – Ph. (914) 574-5467 – This vegan soap shop offers handcrafted soap. The owner; Marie Labropoulos, is vegan and she informs me that “Palm oil is a very common material used in soap-making, however we DO NOT use it. Soap is also typically made with animal fat, we use only vegetable oils.” Marie said the inspiration for this business was “Carrying on the generations-old family tradition of olive oil-based soap-making in order to provide a healthy and vegan alternative to conventional detergents.” In businesses since 2008, their customers, as well as employees, are encouraged to bring their loving animal companions along to their shop! Raw Gaia Ltd - www.rawgaia.com –Email: info@rawgaia.com – Located in Brighton, U.K. – Ph. 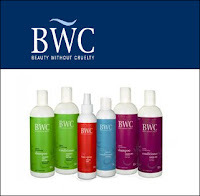 01273 311 476 – This manufacturer and online retailer offer 100% natural and organic skin care products without any alcohol, parabens, fragrance, wax, dyes, toxic contaminants, sodium lauryl or laureth sulphate, petrochemicals, artificial colorants and perfumes, glycols, synthetic preservatives or additives, bulking agents or hidden ingredients of any kind! They make a point not to use bee products. They say they use sustainable/ethical palm oil for their cold pressed soaps. They have certification from all of our suppliers that assures us they don’t test on animals. 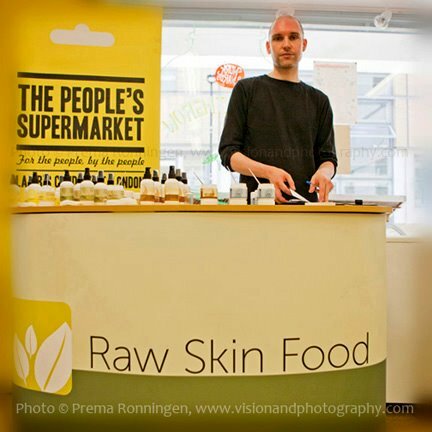 Raw Gaia is certified vegan by The Vegan Society, UK. Owners; Tom and Jessica Fenton, explain the origins of the business: “It was our friend Lisa Lennon who started the company way back in 2005. She had really dry skin and couldn't find anything to help her and so decided to make her own product using cacao butter as a base. Now we have around 40 products and sell to around 15 countries while growing rapidly year on year!” Tom and Jessica are health nuts and eat a high proportion of raw food. 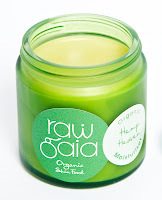 Raw Gaia has been in business for 7 years and they 110% promote the fact that they are vegan! You can follow them on Twitter and Facebook. MuLondon - www.MuLondon.com - Location: London, U.K. – Ph. +442035826035 - Manufacturer of all-natural, organic and 100% vegan skincare products sold to customers around the world through the website, and through numerous selected outlets in many countries. 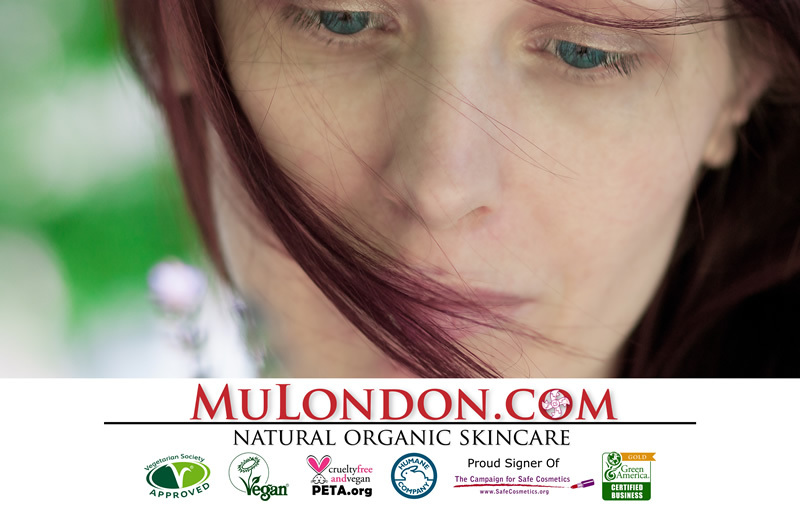 MuLondon products contain no artificial preservatives, emulsifiers or fragrances. Instead, pure natural essential oils and herbal extracts are used to divinely scent and gently preserve, such as: White Chocolate Truffle Moisturizer, Relaxing Lavender, Luxurious Rose, Mystical Marigold, Frankincense & Myrrh or the woody and masculine Hemp! MuLondon is 100% vegan and free from all animal-derived ingredients like beeswax, shellac, lanolin and others. In line with MuLondon’s cruelty-free and environmental policy, the entire range is free from palm oil. The owner has worked hard to find an ethical and palm-oil free source for all ingredients, including the range of cleansers. Boris explains that “The decision to make the MuLondon range vegan was very intentional. I have been vegan for many years now and it was only natural for me to go 100% cruelty-free with my skincare line. Boris; the founder and head cream-whipper of MuLondon assures us “I do not use any ingredients that are tested on animals. I also require that all my suppliers show that they do not conduct any animal testing on their ingredients. In addition to that, MuLondon products only contain safe, naturally-derived ingredients that, unlike novel chemicals, do not require testing. MuLondon is registered Cruelty-Free and vegan by PETA, and MuLondon is a full member of Green America, which shows dedication to sustainability and fair labor practices throughout the whole manufacturing process. 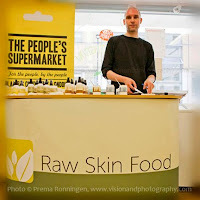 MuLondon is registered with The Vegan Society.” Boris continues “MuLondon started out of a simple idea: Make natural, effective skincare products that contain no additives of any kind. I wanted to create a safe, 100% vegan skincare range to help people with dry and sensitive skin.” MuLondon has been in business since 2008. Dolma Vegan Perfumes - www.dolma-perfumes.co.uk - Email: info@dolma-perfumes.co.uk – Location: U. K. - Dolma is an online and mail order shop offering vegan perfumes and aftershaves. Sole trader; A. Farnath, explains “All Dolma products are blended from safe, high quality, long established ingredients including a large proportion of natural essential oils with perfumery compounds and ethyl alcohol. 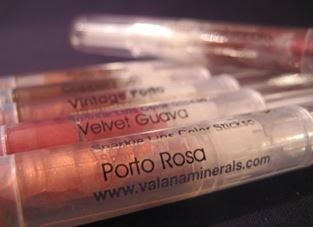 They are suitable for vegans, vegetarians or anyone wishing to avoid animal-derived and animal-tested products. A fixed cut-off date of 1976 applies.” Dolma is certified vegan by The Vegan Society and BUAV (British Union for the Abolition of Vivisection). The company has been in business for 30 years. Yakshi Naturals, A division of Lotus Brands, Inc. -Twin Lakes, WI. USA - Phone: 262 889 8561 - Email: yakshi@lotuspress.com -Manufacturer of Yakshi all natural fragrances; fragrances that capture the wonders of the world. Products are available through the Natural Products Industry, and through website -www.yakshifragrances.com - Not tested on animals. Not vegan certified, but is 100% vegan, though not marketed as such. 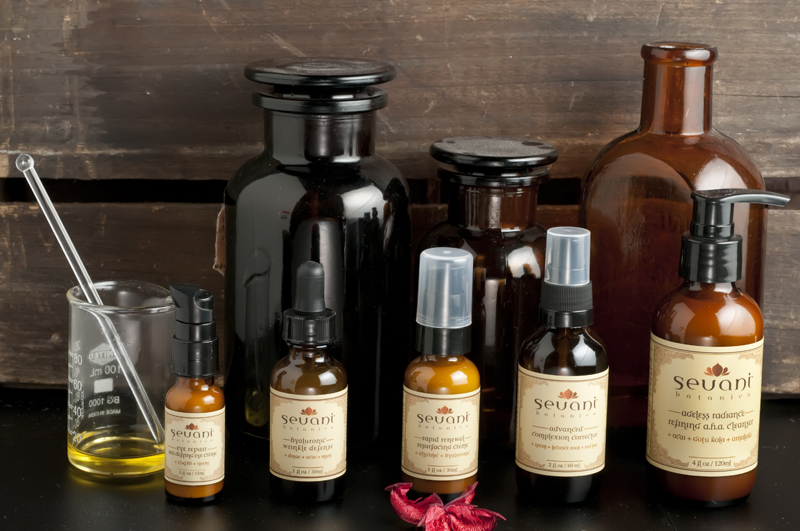 Yakshi Naturals is the new line from Yakshi Fragrances, which has an all-natural base with fragrances. 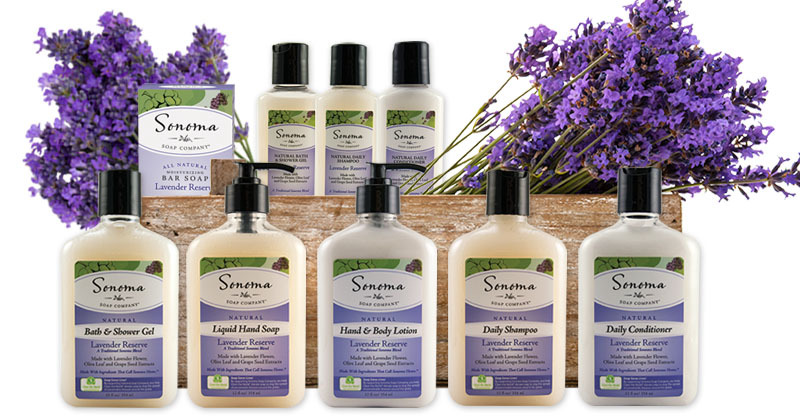 NeemAura Naturals; A division of Lotus Brands, Inc. - website - Twin Lakes, WI, USA - Email: NeemAura@lotuspress.com - Phone: 262 889 8561 - Brand Owner/Manufacturer with sales through the website, etc. NeemAura Naturals brand are intentionally 100% vegan. They offer Neem based Personal Care, Herbal Dietary Supplements, Bulk Neem, Neem Cream, Hand & Body Lotion and Neem Soap. No honey, no unethical palm oil, certified that products are not tested on animals by Leaping Bunny. They are not certified vegan nor do products say "vegan" on the label. Lotus Brands, Inc. is a majority woman-owned company started for the purpose of providing safe, effective and natural alternatives to people for maintaining their well-being in harmony with the planet. When they moved to the Midwest in 1981, Santosh and Karuna Krinsky decided to start a natural products company to help educate the people about natural, cruelty-free alternatives to the chemical products found in mainstream markets. From a small beginning in their residence, the business continued to expand into successively larger facilities until in 1991 it relocated to its present facility in Wisconsin. In 1992, the brands owned by the company were spun off into Lotus Brands, Inc. in order to provide a focus and a dedicated staff to develop and manage these brands. The founders of Lotus Brands, Inc. have been practicing integral yoga since the early 1970’s and Santosh Krinsky is instrumental in founding the Institute for Wholistic Education. The Institute is dedicated to the development of human potential through the integration of spirituality into daily life. The focus is on exploring human evolution and creating opportunities for individuals to bring about meaningful change in their own lives and in human society. ~ Neem has been used for thousands of years and has been documented in the ancient herbal healing science of India, Ayurveda, as well as having hundreds of scientific papers written about its helpful properties. Skin Free RX Skincare - www.skinfree.net - Location: Virginia Beach, VA, USA – Ph. 1-888-450-2450 toll-free. Skin Free is an online skincare line for people with sensitive skin; offering soaps, cleansers, moisturizers, and herbal remedies. 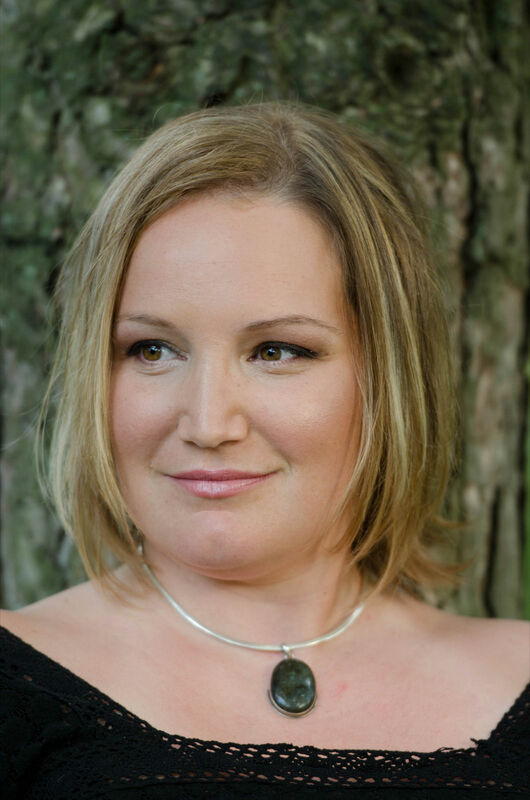 Julie Hilton is a pharmacist with a background in compounding, and she realized that artificial fragrances, colorants, and harsh chemicals can cause a great deal of the skin issues that she saw in her patients. She wanted to use the natural ingredients found in oils and butters such as olive, shea, tamanu, coconut, and macadamia to prevent and alleviate skin issues. She uses soy over bee products. She uses palm oil, but says it is sourced from places that do not displace wildlife. She's opposed to animal testing of any kind and does not use ingredients that have been animal tested. 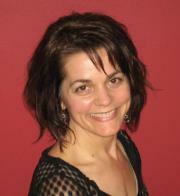 Julie began formulating products for her Skin Free line in 2005. Julie is not vegan; however her products are! She feels that plant sources are the best for the types of products she makes. Sonoma Soap Company; a division of Lotus Brands, Inc. - website - Twin Lakes, WI, USA - For Order Inquiries call 1-800-824-6396 - Email: info@sonomasoapcompany.com - Brand and Manufacturer, products for sale on website and retail. All products are intentionally 100% vegan. "There may be small amounts of palm oil used, but we have been assured that it has been sourced from the rain-forest alliance/sustainable palm oil round-table to avoid habitat destruction." says Tom Olson; company representative. 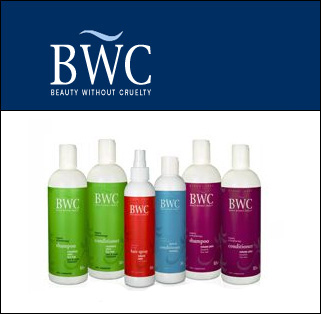 He continues "We absolutely maintain a cruelty-free - not tested on animals - requirement on all of our products. We are certified and listed as cruelty-free by Leaping Bunny Coalition for Consumer Information on Cosmetics as seen here - Sonoma Soap Company is a majority woman-owned family business. 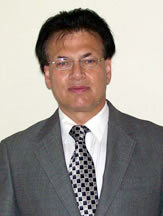 Santosh krinsky is the CEO. Ownership is strict vegetarian. Some members of the staff are vegan, but this is not a requirement to work at the company. In the late 1990s, exceptional natural soaps were carefully hand-crafted in the beautiful wine country region of Sonoma Valley, California. Those unique soaps were the precursor to today's Sonoma Soap Company, makers of premium quality all-natural body care products including shampoos, conditioners, liquid hand soaps, bar soaps, bath and shower gels, and body lotions. V-dog –www.v-dog.com - Email: info@v-dog.com - Ph. 888-280-8364. Locations: Sacramento, CA. and Memphis, TN. Sells Vegan Dog Food and Treats. 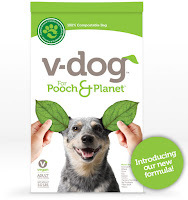 Unlike many other providers of vegan dog food, V-Dog sells ONLY vegan products. The company is owned by David Middlesworth, who is a long time vegan who loves dogs. V-Dog is a dedicated vegan family business devoted to bringing the very best vegan dog food and treats to market, since 1995. Harbingers of a New Age - www.vegepet.com - Email: info@vegepet.com – Location: Troy MT., USA - Ph: 406 295-4944 Fax: 406 295-7603. 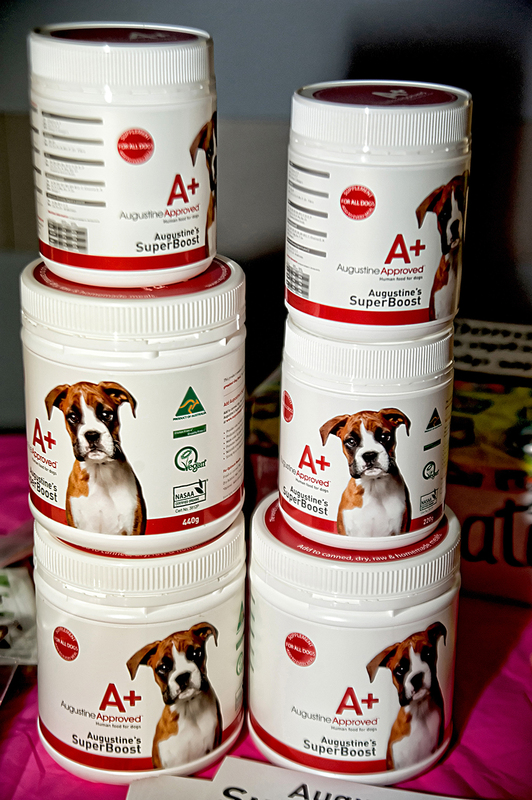 HOANA manufactures a line of supplements that enables cats and dogs to eat vegan and maintain excellent health, and is sold online. All products are labeled vegan. The owner; James Peden is a vegan, the rest of his personnel are vegetarian. HOANA has been in business since 1986 (26 years!) providing a means for dogs and cats to be healthy on a vegan diet. This unique product is distributed in 38 countries! 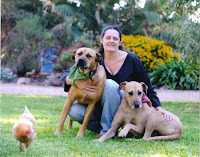 Evolution Diet Vegan Pet Food and Holistic Health Consulting Service – www.petfoodshop.com. Evolution Diet is a vegan pet food design, manufacturing and distribution company. Evolution Diet sells food directly from their offices and warehouse in downtown St. Paul, MN., USA - and online. They provide a full line of gourmet dry and moist dog, cat, and ferret foods along with a full line of vegan supplements; everything is vegan as they are an animal-rights based organization. They certify that their products are vegan themselves. Evolution is owned and operated by vegan staff. CEO is Eric Weisman; Dr. of health sciences, holistic practitioner, and the president is Lynn Crandall Weisman. In 1988, the inspiration for the company came when the Weismans “witnessed how horribly the animal farming industry tortures and kills animals” – and they've been operating the last 24 years since then. Their gourmet pet foods can be modified for specific health conditions and palatability requirements just by adding different foods and supplements to them. Max and Ruffy's Natural Organic Treats for Dogs - www.maxandruffys.com/ - Location: Maryland, USA - From the small Max and Ruffy’s bakery, they offer a wholesome selection of delicious, healthy dog treats that are crafted with the human-grade, certified organic ingredients. They are also free of wheat, corn, soy and GMO's. The treats contain no no additives, no artificial coloring, no flavor enhancer and no preservatives, no ingredients that were sourced from human or animal exploitation. 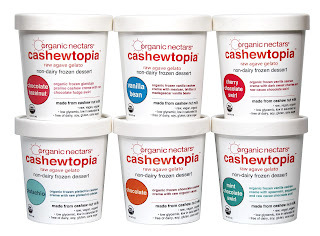 Treats include Five-Star Blueberry, Butternut Squash & Kelp flavor, Coconut, Molasses and Flax flavor, Mother Quinoa's Pumpkin Patch and Powerhouse: Sweet Potato and Alfalfa flavor. Kelly Raiser and Beth Grace are the owners. The business is owned by vegans - and staff are constantly inspired to become vegan! They tell us "Our passion and love for dogs was the driver for starting Max & Ruffy's. We had been baking homemade treats and food for our pack, and then began sharing the goodies with our friends and veterinary professionals. Everyone who tried the stuff pushed us to start a business, so in 2009 Max & Ruffy's was born." The owners, Beth and Kelly, are partners in life and in business. They're three dogs, Edith; an 18 year old Beagle, Grover; a 10 year old Chihuahua mix, and Jyoti; a 5 year old Chihuahua mix go to work with Kelly everyday at the bakery! Bed and Broccoli - www.bedandbroccoli.com.au - Vegan Bed & Breakfast in Australia; offering vegan food, sauces, jams, preserves and chutneys, etc. and they make the bulk of their cleaning products, and purchased ones are always ethical. Their label/logo: Bed and Broccoli...a very vegan experience. Their policy is NO animal food by-products allowed on property. Vegan owned and operated by Nikki Medwell, who explains “Being vegan and unable to find vegan accommodation is what inspired Bed and Broccoli to open for business in November 2011.” Nikki tells us that they rescue abandoned animals and that makes them what they are, and that those animals have the ability to educate non-vegans by just 'being'. The Ginger Cat Bed and Breakfast of Watkins Glen, N.Y - www.gingercat-bb.com - located 5 miles north Contact: Gita Devi - Ph. 607.535.9627 Email: stay@gingercat-bb.com – All food and bath products are vegan. The vegan margarine does contain palm oil. Gita tells us “After working at Farm Sanctuary and helping with the B&B cabins, I knew there was a need for a 100% vegan B&B in the area.” Owner; Gita Devi is a long-term vegan, animal activist who opened the Ginger Cat’s doors in 2008. The Lodge - www.thelodgegrenada.com - Email: thelodge@spiceisle.com - St. George's, Grenada, West Indies - Ph. 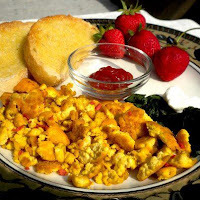 +1 473 440 2330 - Freephone (US and Canada only): 1 877 528 6120 - 100% Vegan Guest House – Bed and Breakfast, certified by U.K. Vegan Society. Mark Hardy is the owner and he tells us the inspiration for The Lodge was “to offer fellow Vegans/Veggies the vacation that my late wife and I were never able to find.” The Lodge has been in business for 10 years (2002). 100% Vegan (including all cleaning materials, etc.) The owner is organic and vegan for 26 years. The Barn Vegan Guest House - www.veggiebarn.net – Located in New Forest, South of England, U.K. - Exclusively vegan accommodation; providing vegan food and household goods (soaps, duvets, products that were not tested on animals, etc.) They are certified by The Vegan Society U.K. 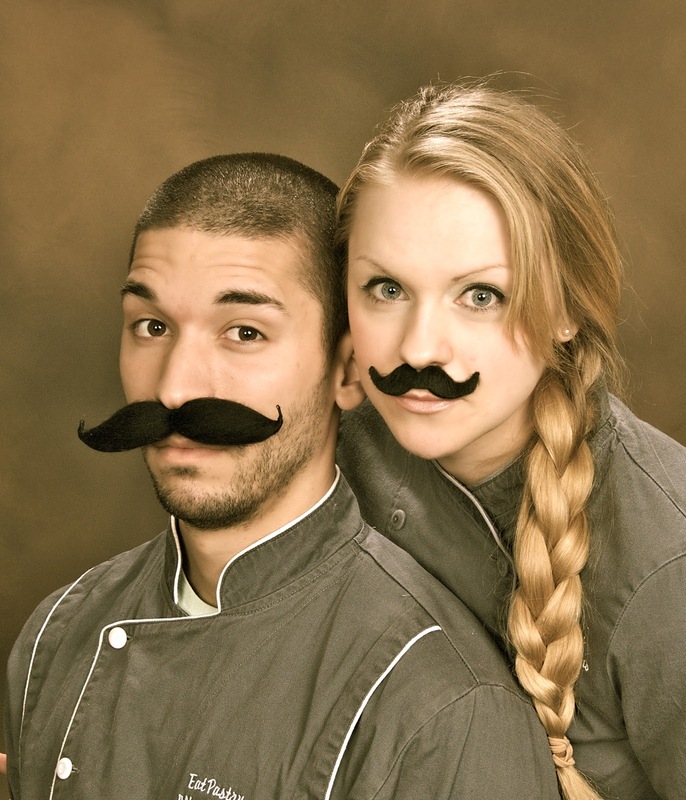 The owners are a joint partnership of Richard and Sandra Barnett; both vegans. They were inspired by visiting a vegan guest house in Ireland 15 years ago, and The Barn Vegan Guest House (which is in a real house, not a barn) has been in business since 2003. Richard and Sandra tell us that they are 100% solar powered, too. *Camp Exploration - www.CampExploration.org and www.VeganCamp.org - vegan camps for children during summer and winter vacations - 100% vegan - U.S. since 1992. *Mars Academy - www.MarsAcademy.org and www.VeganSchool.org - vegan school for children - * www.KidsMakeADifference.org - vegan weekend programs for children - *www.VegKids.org - club/group for children who are vegan to get together and realize that they are not alone in their conscious choices and living. *Perpend Educational Services - www.Perpend.org - educational consulting, counseling, tutoring, etc. for children, parents, schools, etc. These educational, family, youth, services are offered by Andy Mars, Ph.D of Tarzana, CA., USA - Ph. 818.344-7838. Dr. Mars has been on the Board of Trustees of The American Vegan Society for a quarter of a century. 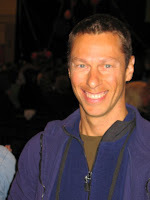 He is actively involved as a leader of the vegan community of Los Angeles. He set out to provide “the most completely conscious, best programs for kids and our world.” All snacks offered are 100% vegan. Staff is vegan. These camps and programs have allowed children and families to explore vegan living and they've had hundreds of kids who have gone vegan from attending these programs. Youth Empowered Action Camp - www.yeacamp.org - is a summer camp for youth 12-17 who want to make a difference in the world. YEA trains young activists and builds knowledge, skills, confidence and community with youth change-makers. YEA Camp serves all-vegan food, although being vegan is not a requirement to come to the camp. YEA Camp is operated by two vegan directors who are activists on a variety of issues. YEA Camp was founded in 2009 and operates camps in Oregon, California, New Jersey and adding a fourth location in 2013. Vegan Edge Consulting - Email: simon@veganedgeconsulting.com - Facebook Page - Operates worldwide online (with physical bases in England, UK and Ontario, Canada) – Ph. 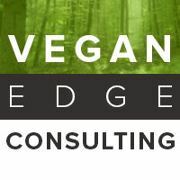 613-967-7989 - Vegan Edge Consulting is a full service Business Development & Marketing agency working exclusively with vegan businesses & entrepreneurs. They offer Strategy & Planning, Branding & Marketing, Web Development & Graphic Design services. Owner; Simon Allard is a business coach and marketing strategist by profession and has been running his own consulting company since 1999. Simon explains “However, because I am passionate about my veganism (my whole family are strict vegan too) I have newly set up "Vegan Edge Consulting" as a separate business to EXCLUSIVELY help vegan businesses and entrepreneurs. This means I can now combine my years of business and marketing experience with my ethical lifestyle choices to help other vegans in their business pursuits.” They also run several other Vegan Facebook pages: Vegan Business Guide, Toronto Vegan Guide. Become A Vegan, and Vegan Maven. 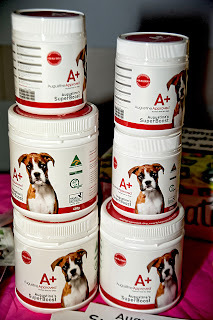 Cruelty Free Super, offered by Ethical Money Pty Ltd. - www.crueltyfreesuper.com.au. There's also a separate Blog looking at global aspects of Cruelty Free Money - www.crueltyfreemoney.com. Cruelty Free Super has been designed to be Australia's first on-line only Superfund, promoted via social media and our members. It’s a vegan-friendly Superfund, investing in line with cruelty free principles. Lee Coates OBE, founded Ethical Money Pty Ltd in Australia on 10/10/10 (2010) and remains Managing Director. Lee tells us that there’s “No animal testing - it wouldn't be cruelty free if we allowed any testing, even for pharmaceutical research.” This very innovative vegan business takes cruelty free principles to the heart of the very animal unfriendly financial system. Amazing list! Thank-you. One thing to note is that sadly Cafe Gratitude no longer has a location in SF :(. 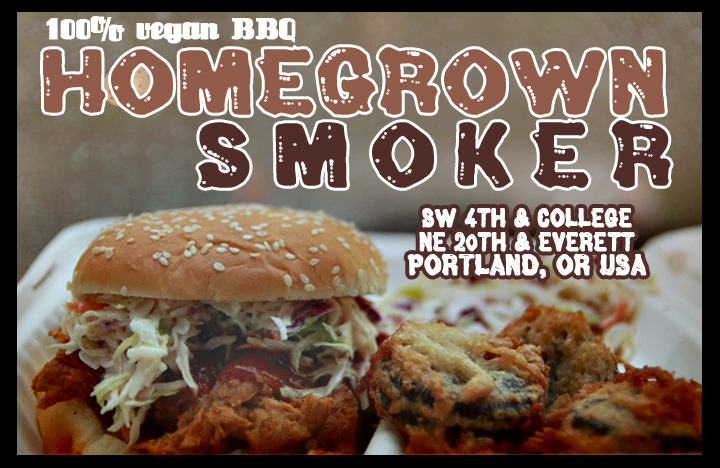 Ummmm...Portland, OR is one of the most vegan friendliest cities in the world. Did you forget us? Anonymous - I didn't forget Portland, Oregon, but they forgot me! I sent out a lot of questionnaire's to vegan businesses that were not responded to! James Kaufman, you can add it, I couldn't. Veganism is still crap and in no way going to be mainstream. This is an omnivore world and you guys are just specks of crap in it. The last anonymous, thanks for your "words of wisdom". Obviously we don't agree. Not only is veganism not "crap" but it is a Great Truth, a moral imperative, Justice for All Sentient Animals, a way to achieve Peace on Earth for real and get a grip on the escalating, rampant, and very scary violence permeating human society, and a way to heal our ailing planet, a possible solution to global warming; ending animal agriculture is more responsible for greenhouse gases than anything else, as well as horrific environmental devastation. But most importantly, veganism is a cure for a very unfeeling, almost numb humanity - that has not yet risen to see that we have no right to violently assault anyone; any sentient, feeling, fully conscious being. What a wonderful list, and I am pleased to see that it is so long!! Thank you for putting it together. It is great to have a little resource all on one page - with just enough info, and a photo to help me along. Big kudos & support to all of these businesses - living your dream is brave, but you're obviously all doing it - congratulations! Hopefully we can make it to the next edition! Hola,Gracias por esta guía!! !.Yo conozco varios negocios más en España veganos.Si quereis puedo pasaroslos. Hello, thank you for this guide.I know several business in Spain vegans.If you want I can pass them. Thank you for this fantastic list. You forgot this fantastic UK online pet food store, Europe's largest vegetarian pet food outlet. 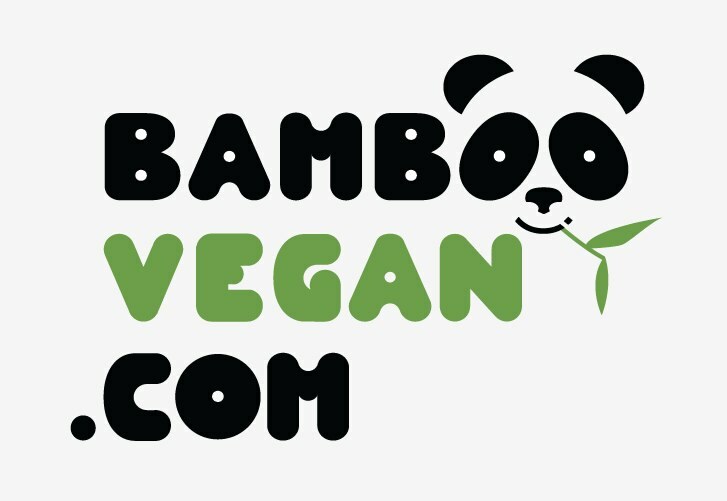 http://www.vegan-france.fr/ecommerce-vegan.php: lists online vegan stores for everything. http://www.unmondevegan.com/index.cfm: online store plus 2 physical stores in Paris and Lyon! We just opened our vegan organic online store. So if you could add it to your listing it would be great ! Consuming vegetarian or vegan food is healthier way to keep your body fit and slim. Prana Cafe, the luxury health food cafe in Leicester offers you fresh vegan diet meals full of vegetables, fruits, legumes and whole grains.